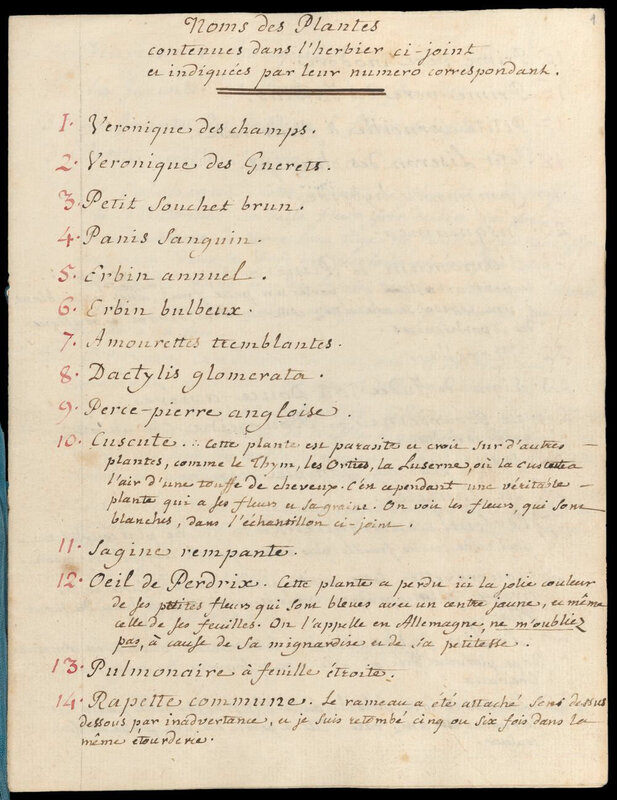 Jean-Jacques Rousseau (1712-1778) died 240 years ago on 2 July. 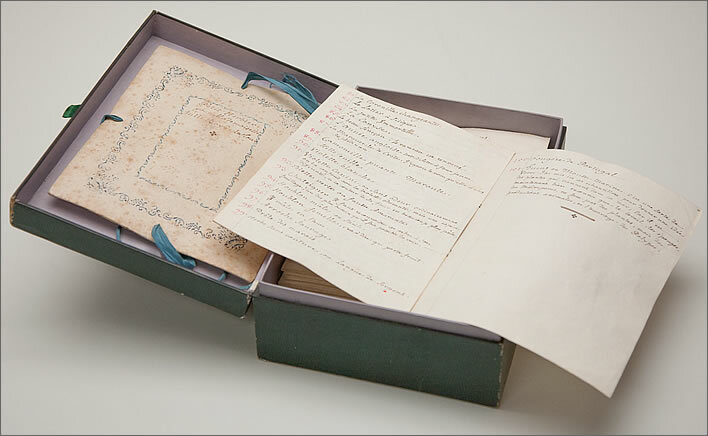 We shall spare our readers yet another disrespectful tirade at his confused ideas, his rhetorical genius, his intellectual madness, his disgraceful character and his malign influence on his age and – much worse – subsequent ages. 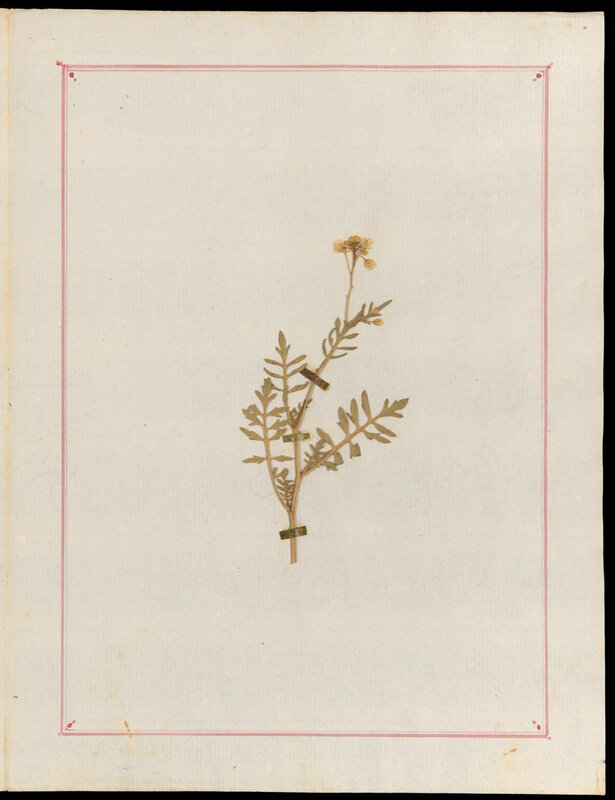 No, let's be nice for a change. 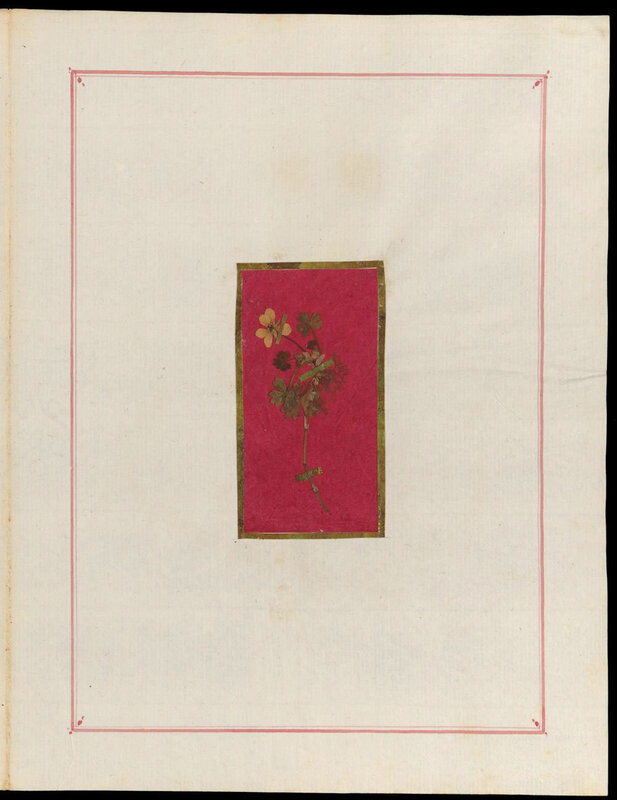 It will take some effort, but we shall do our best. 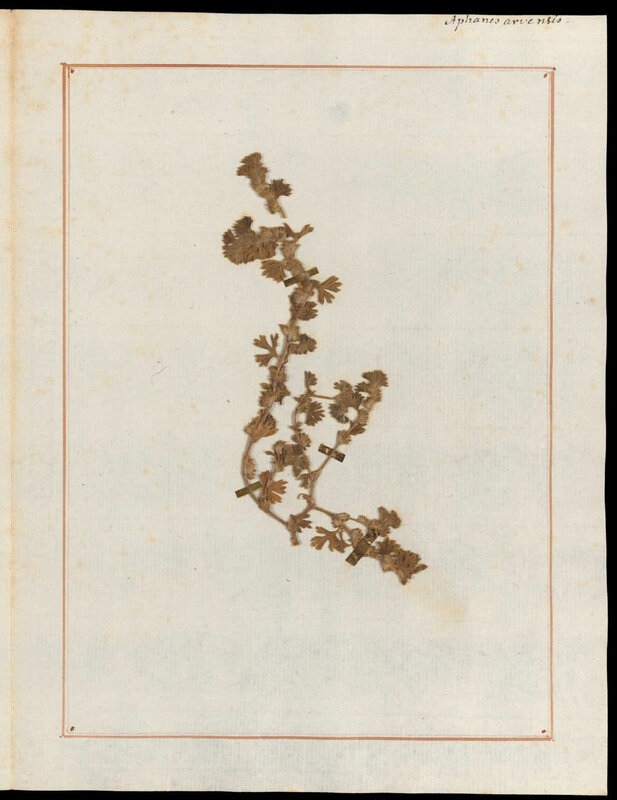 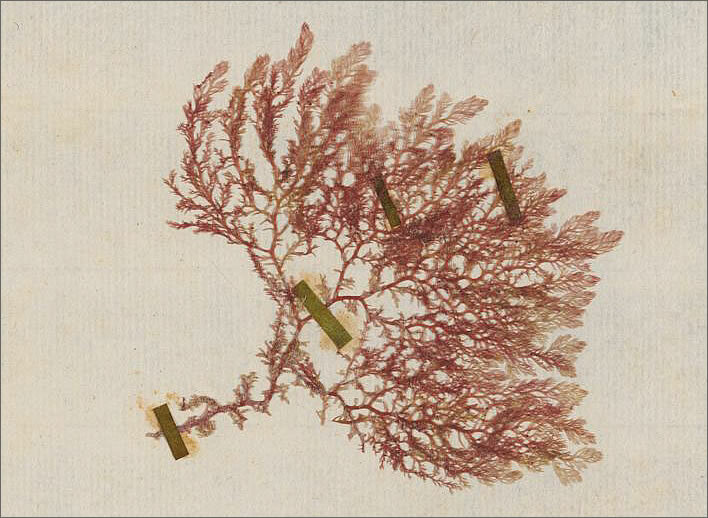 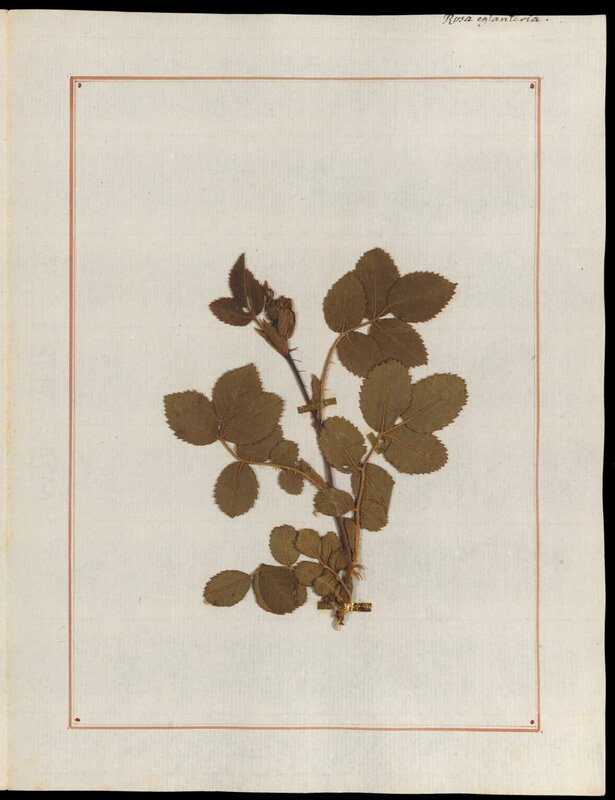 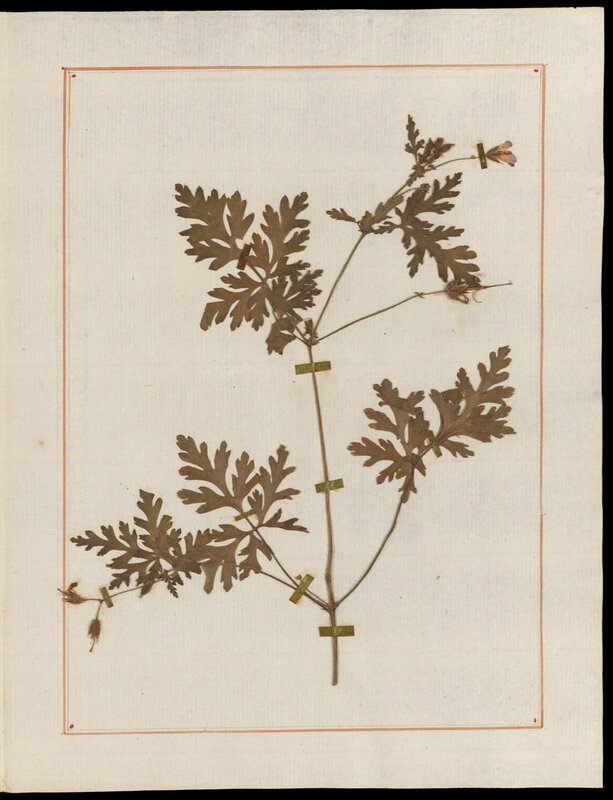 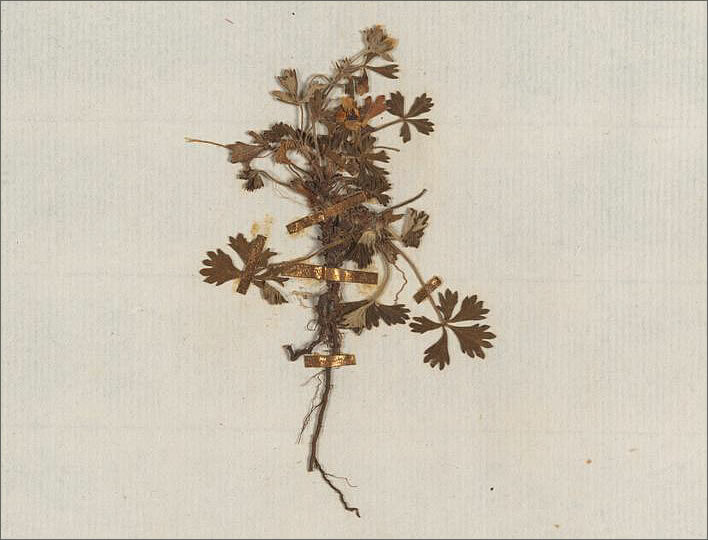 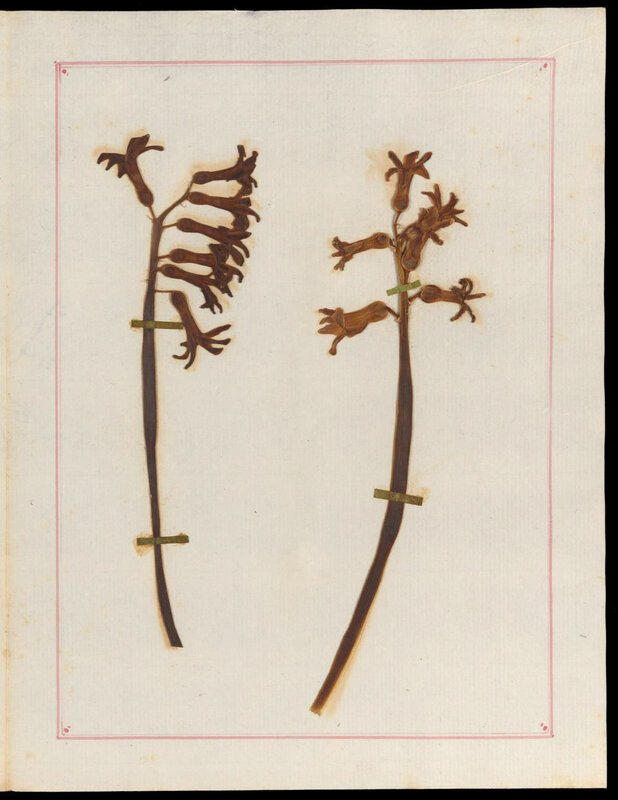 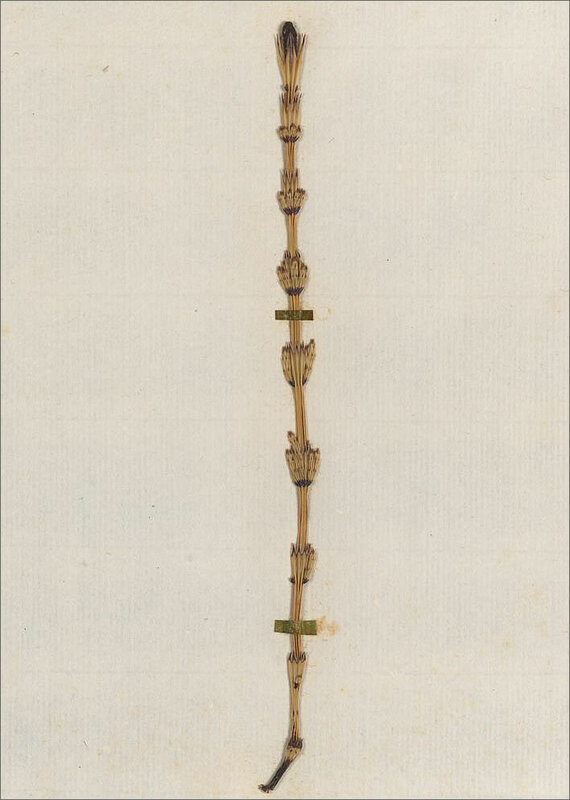 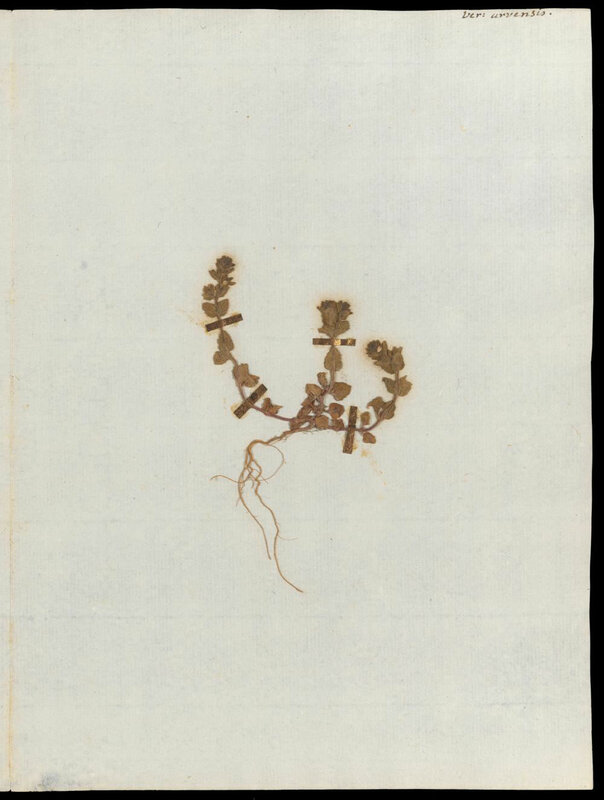 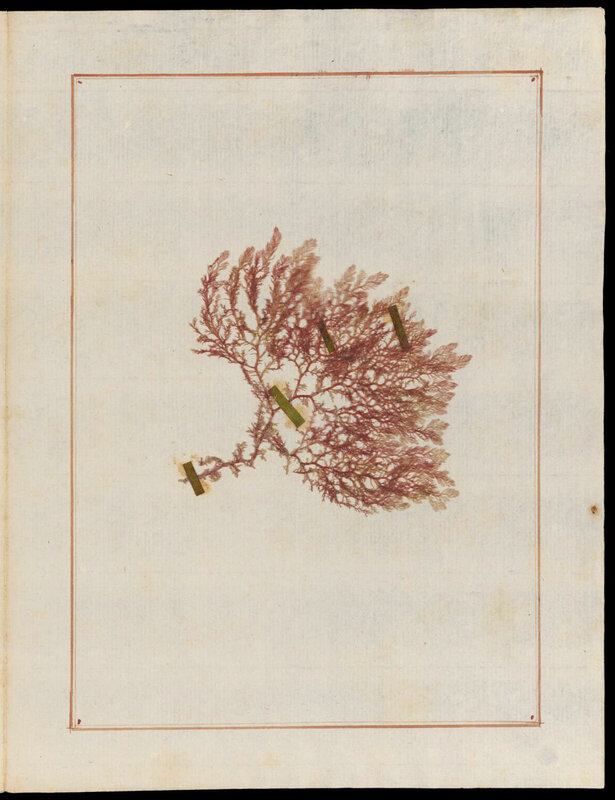 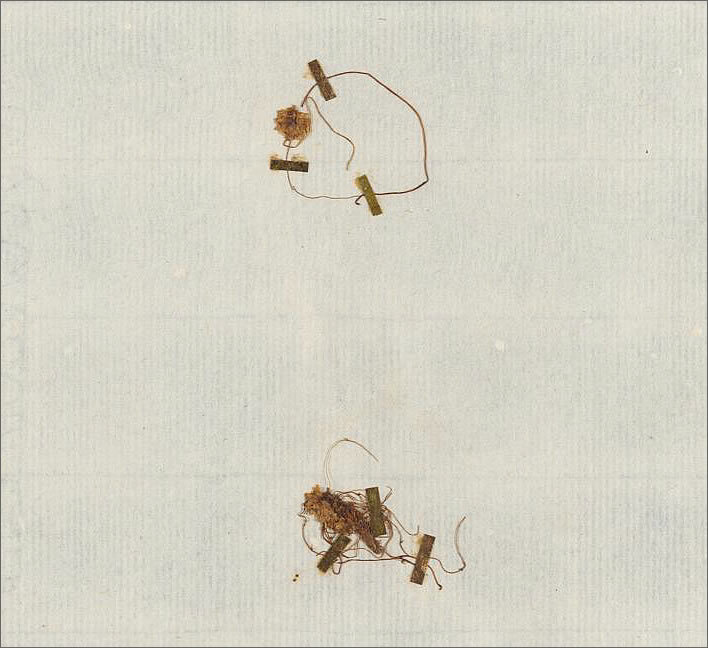 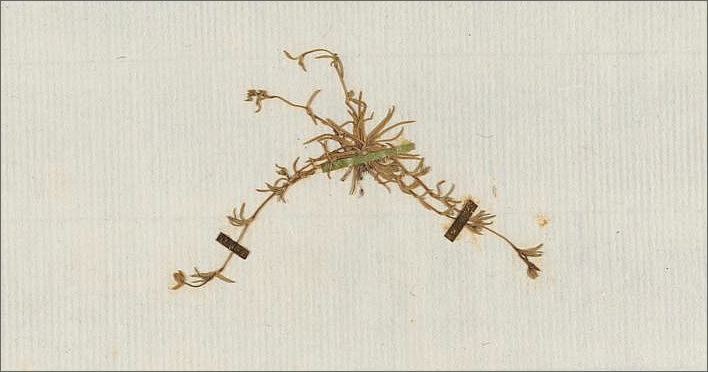 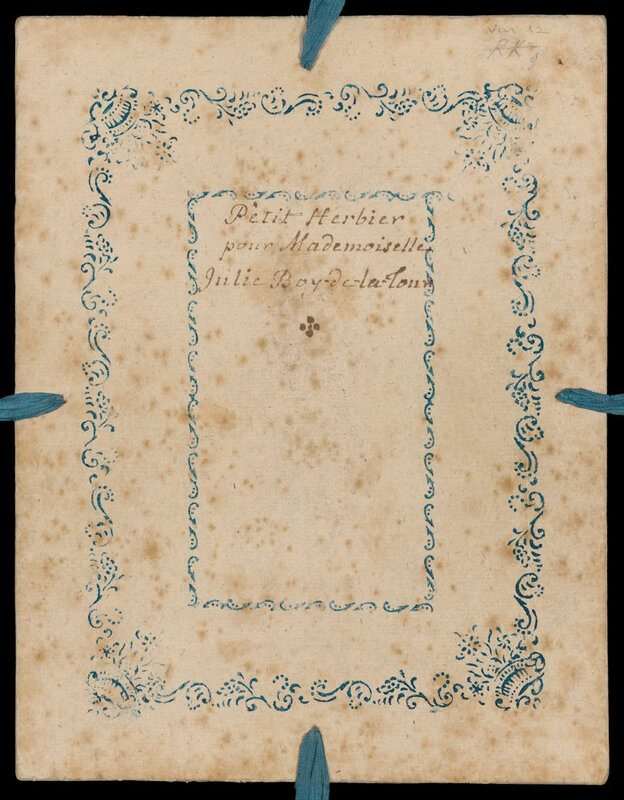 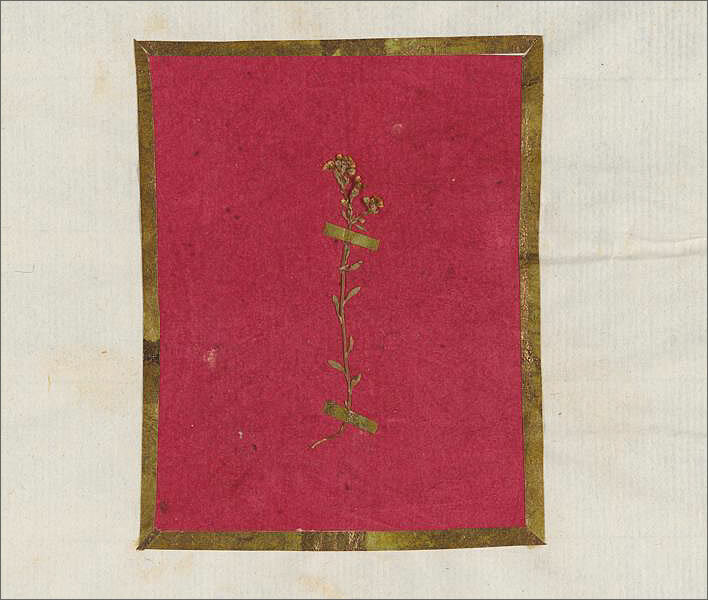 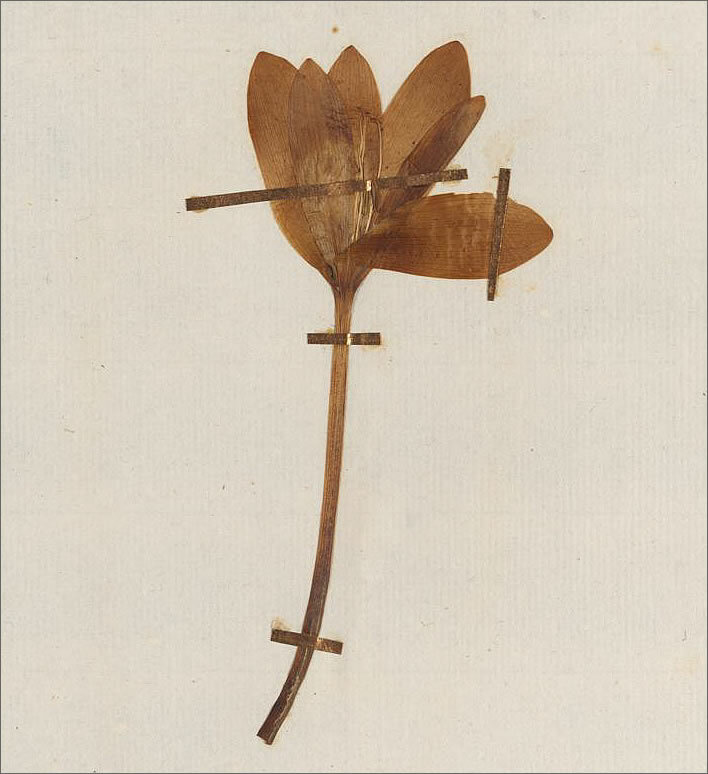 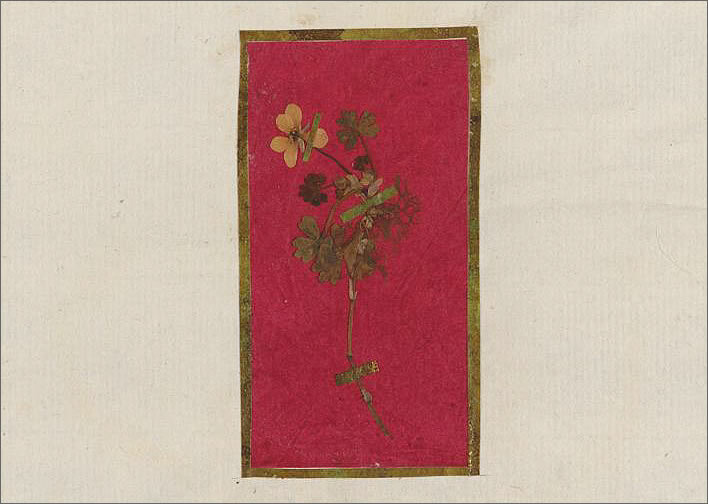 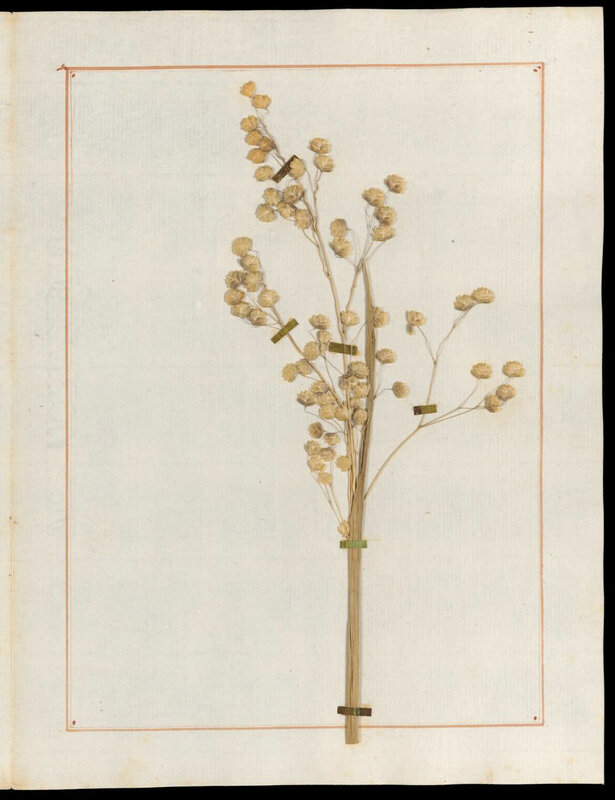 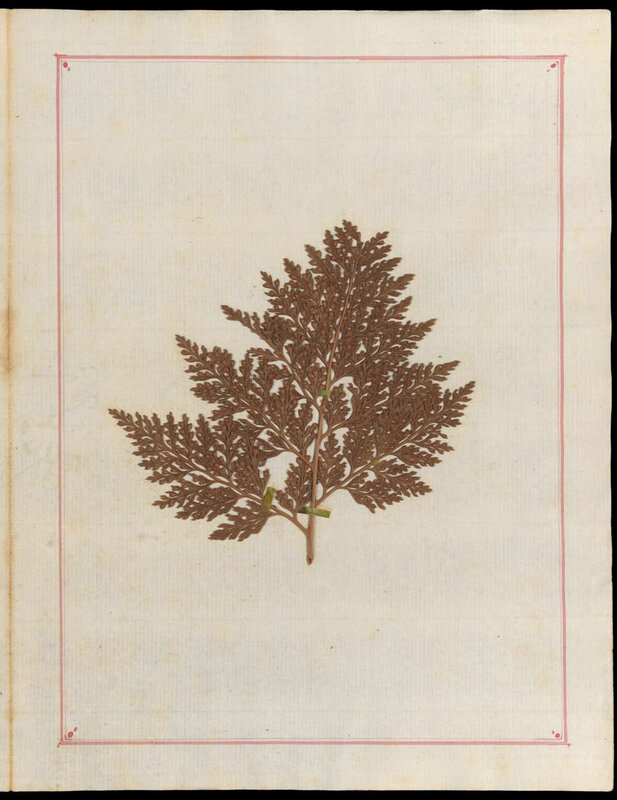 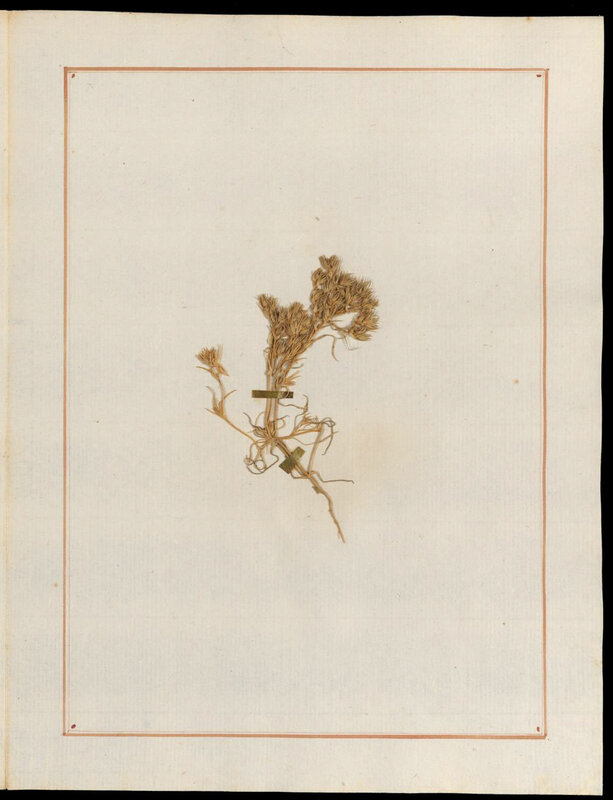 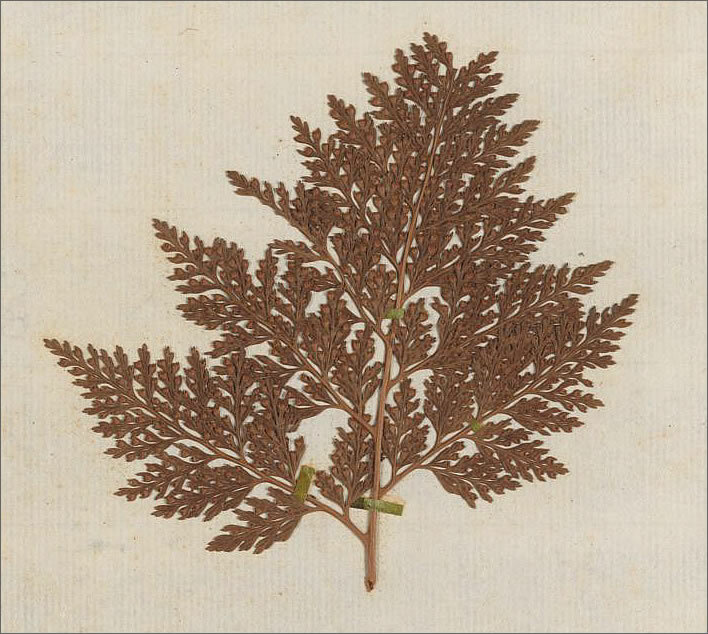 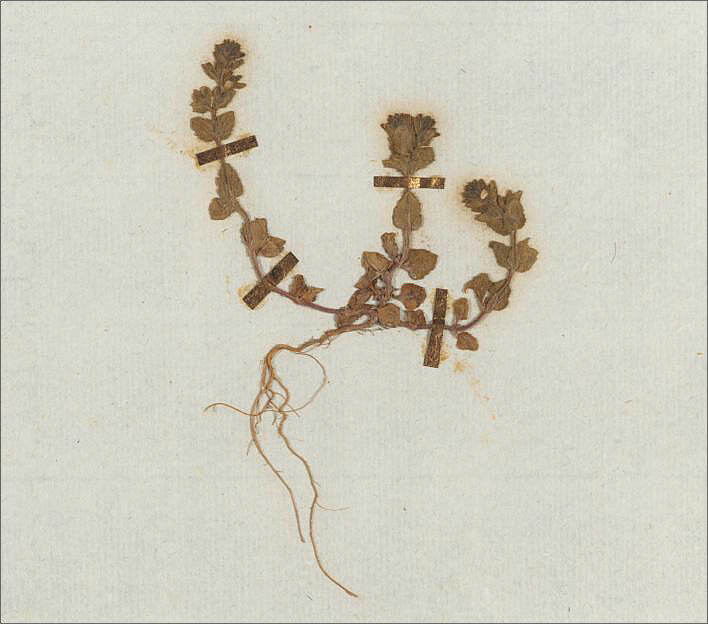 Let's show some samples from one of the jewels of the collection in the Zentralbibliothek in Zürich, a herbarium that Rousseau sent from Paris as a gift in 1772 to Mademoiselle Julie Boy de la Tour, daughter of Madame Marie Boy de la Tour Roguin, his friend and protectress. 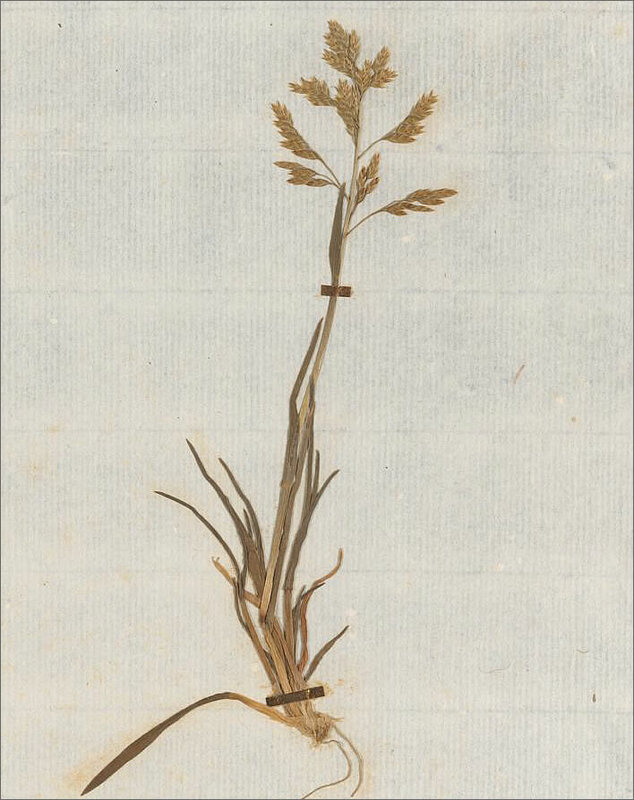 Rousseau was a keen walker and plant collector: many of his strolls were intended as plant collecting forays. 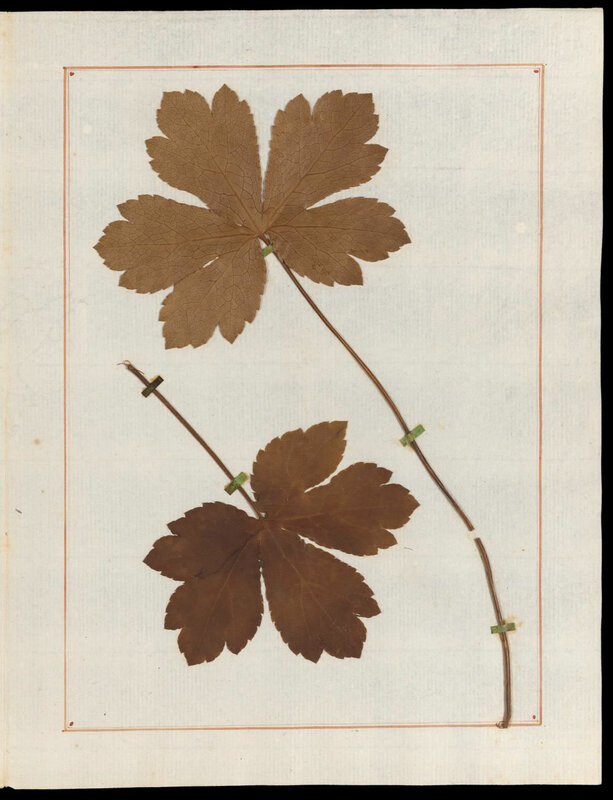 The images that follow are only a selection of the 211 pages in Julie's herbarium. 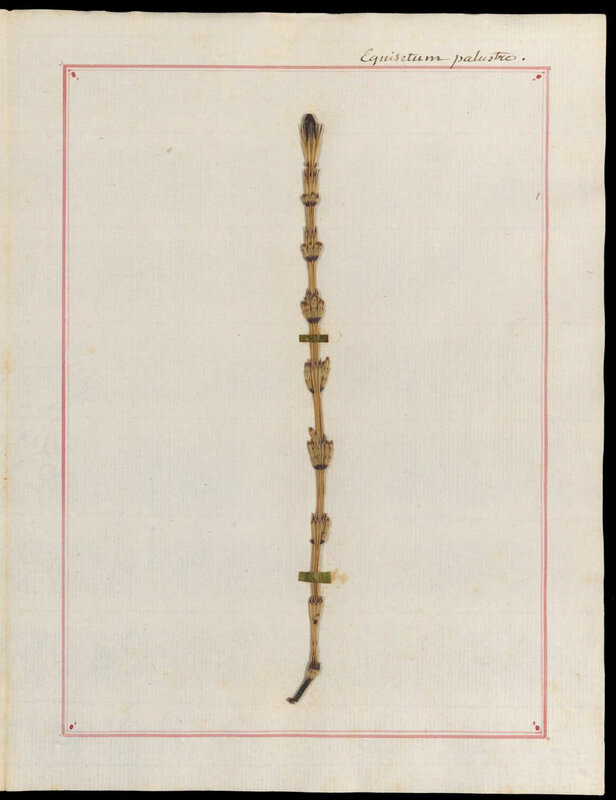 The full object can be viewed on the excellent e-manuscripta website of the Zentralbibliothek Zürich, who are to be praised for their efforts in making so many items of their collection, along with other Swiss institutions, accessible for the general public. 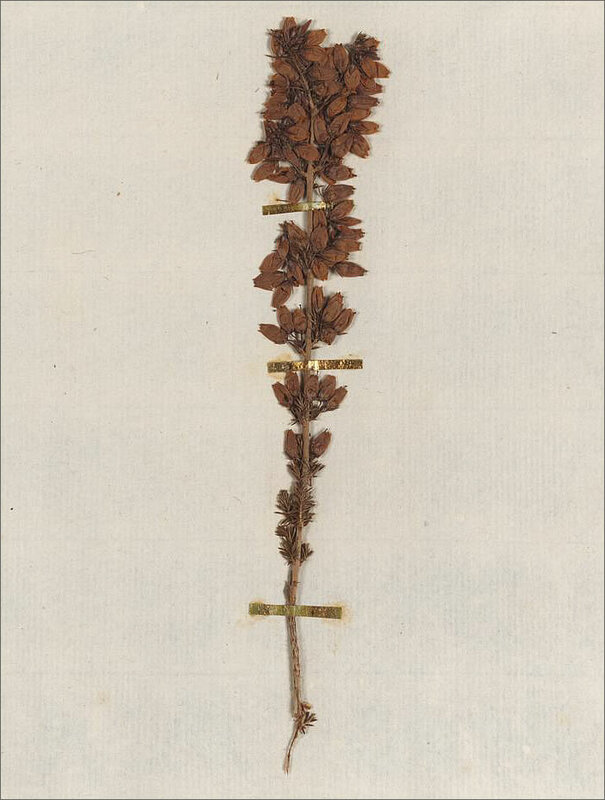 Rousseau provided a seven-page list of plant names keyed to his specimens. 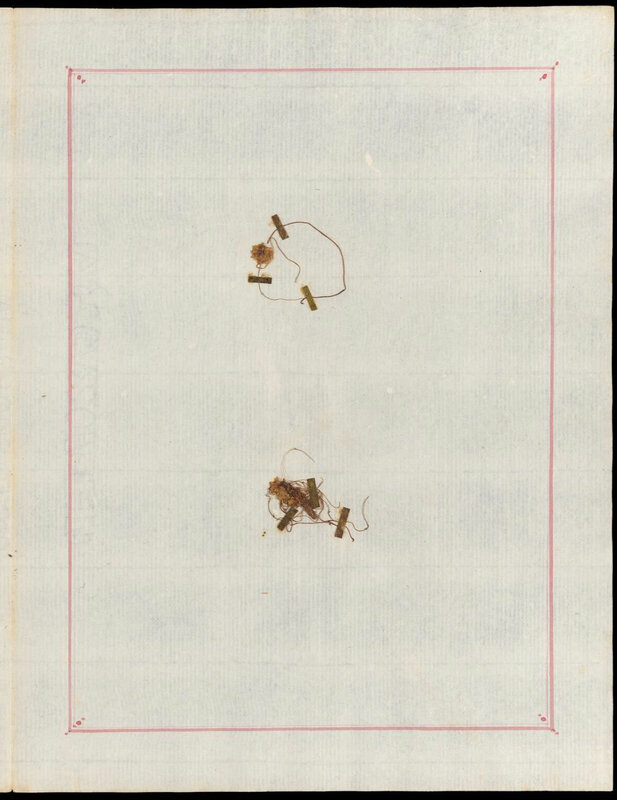 Since our images are not comprehensive, only the first of these pages is shown here as an example. 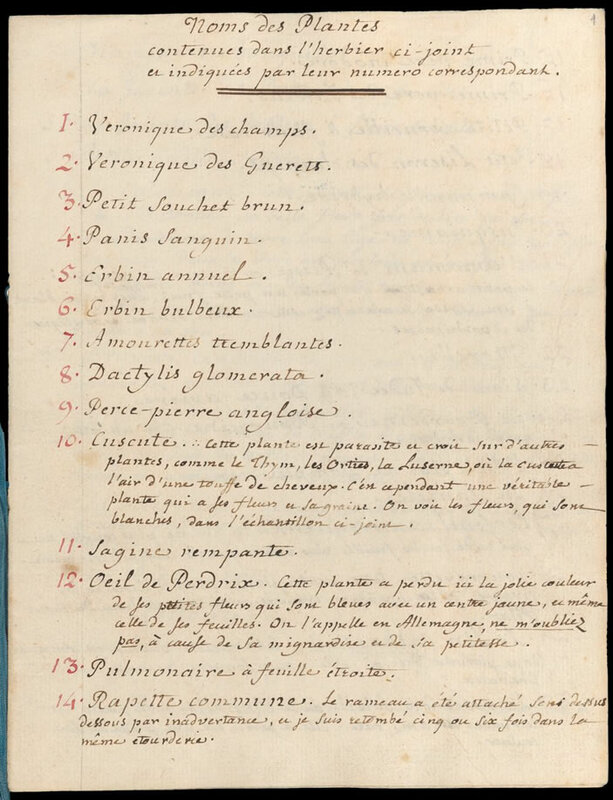 If you are interested in Rousseau's naming of his specimens than you should go to the e-manuscripta site. 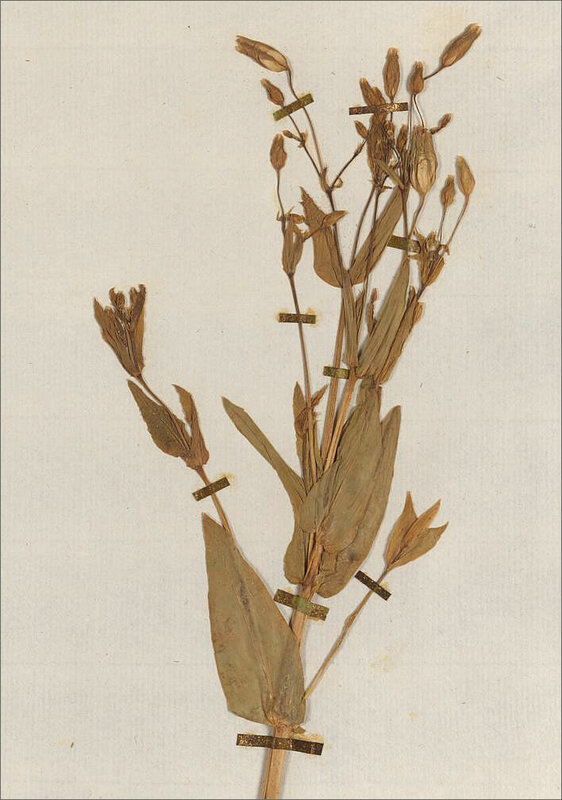 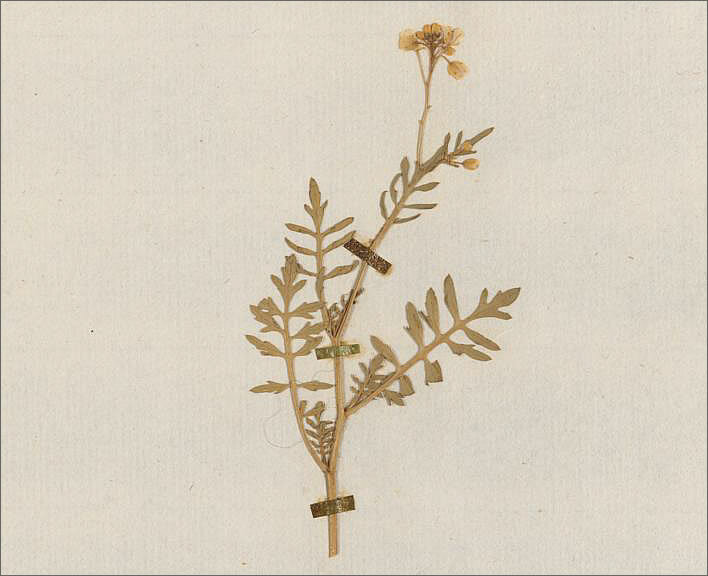 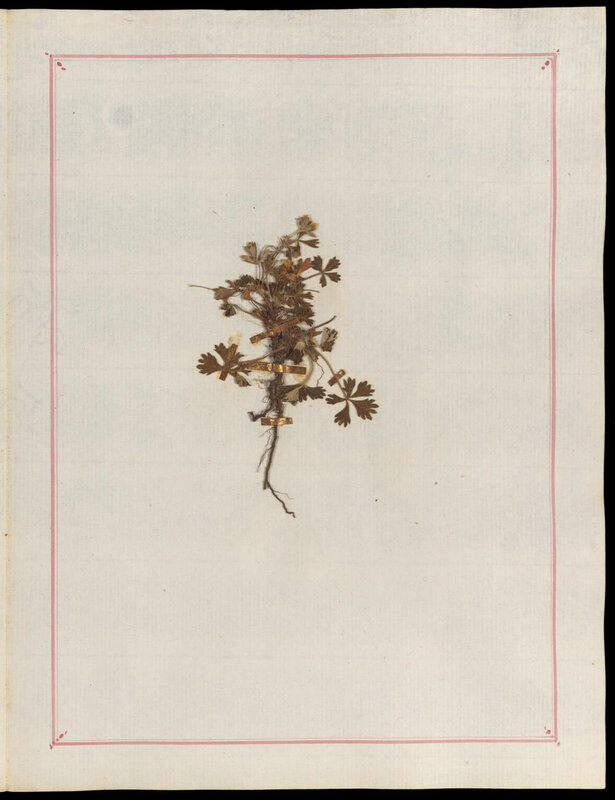 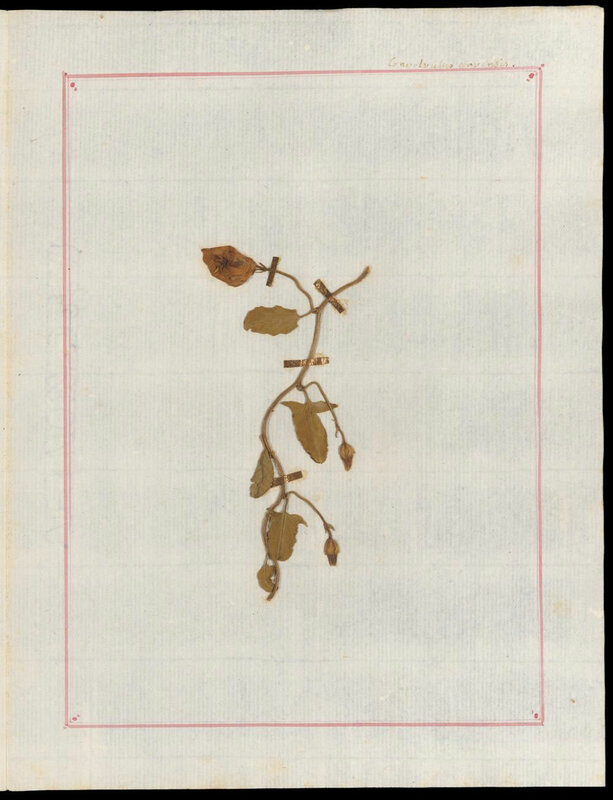 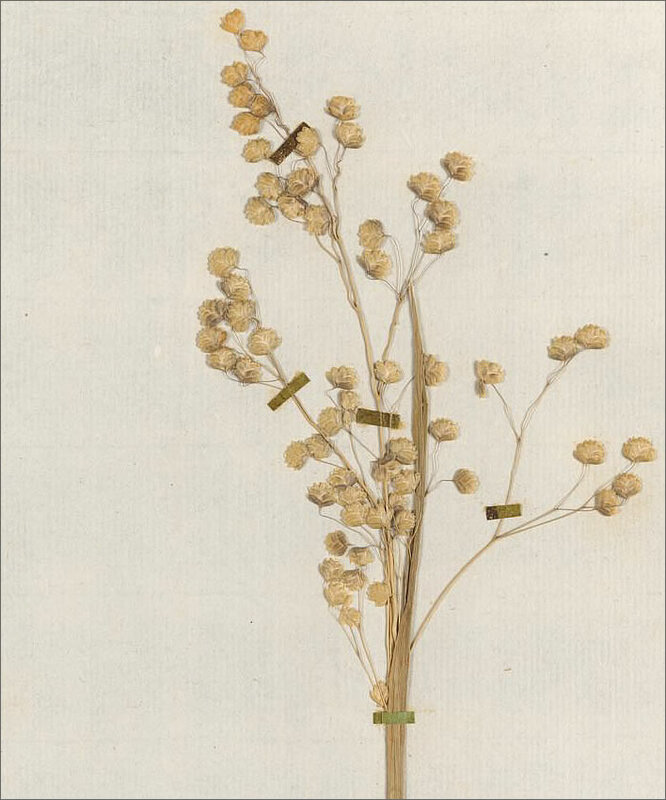 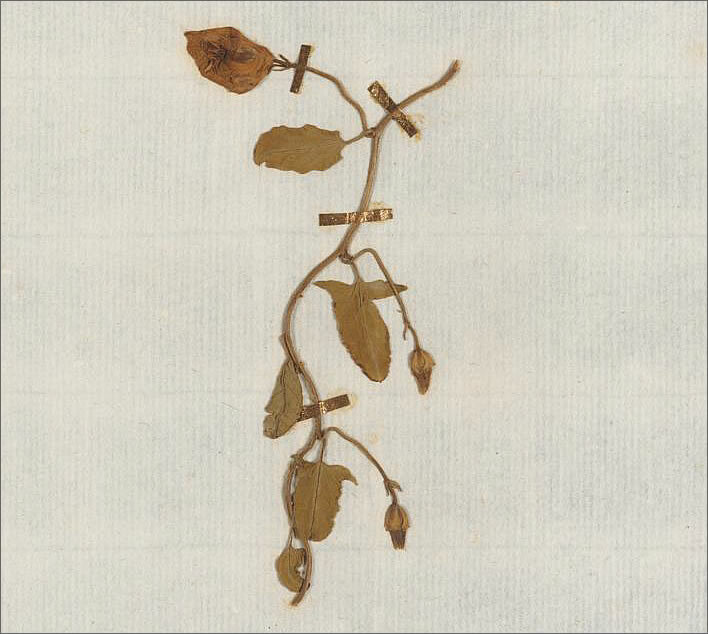 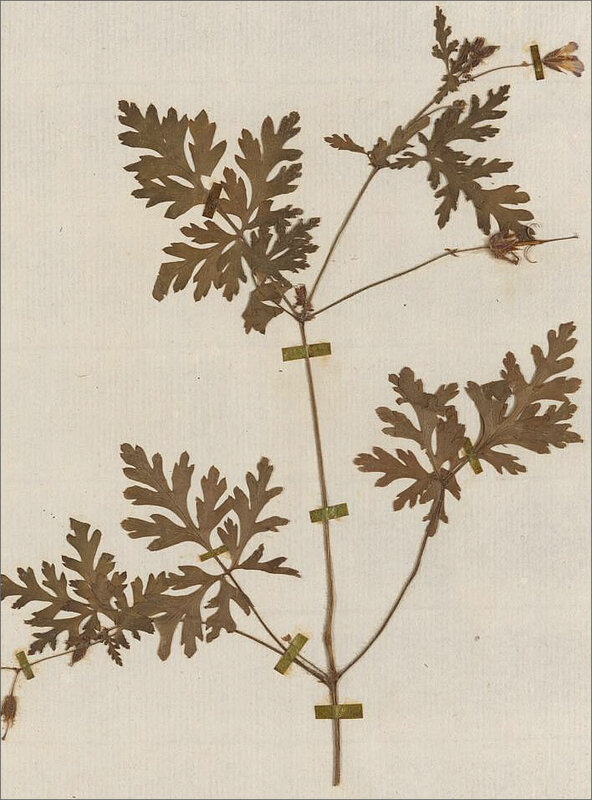 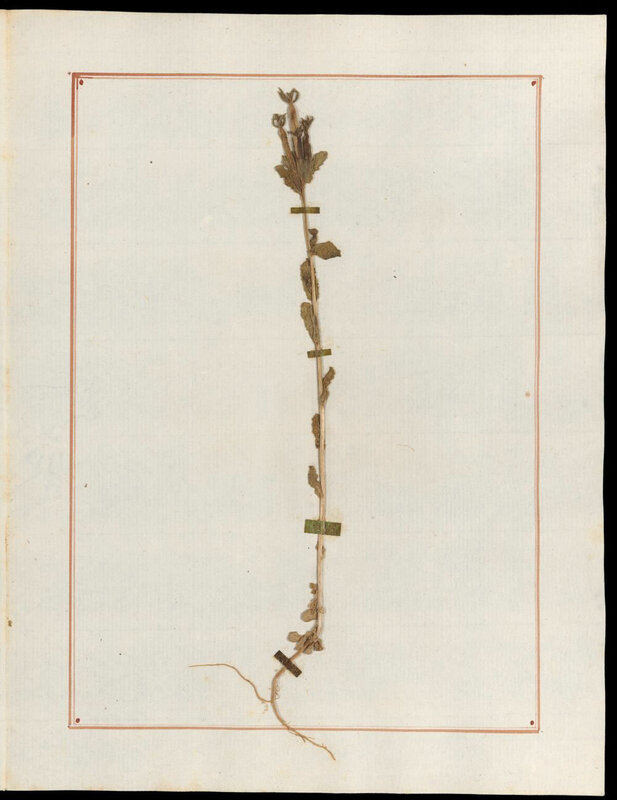 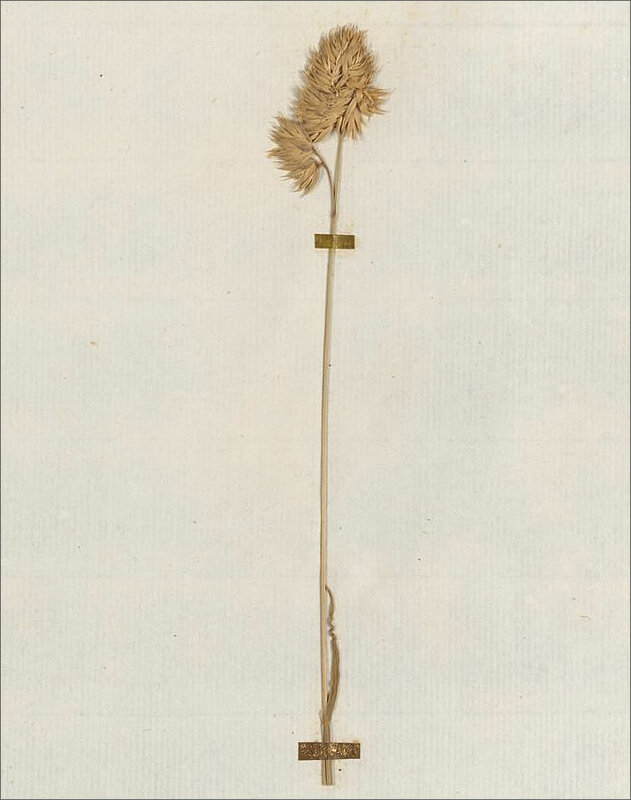 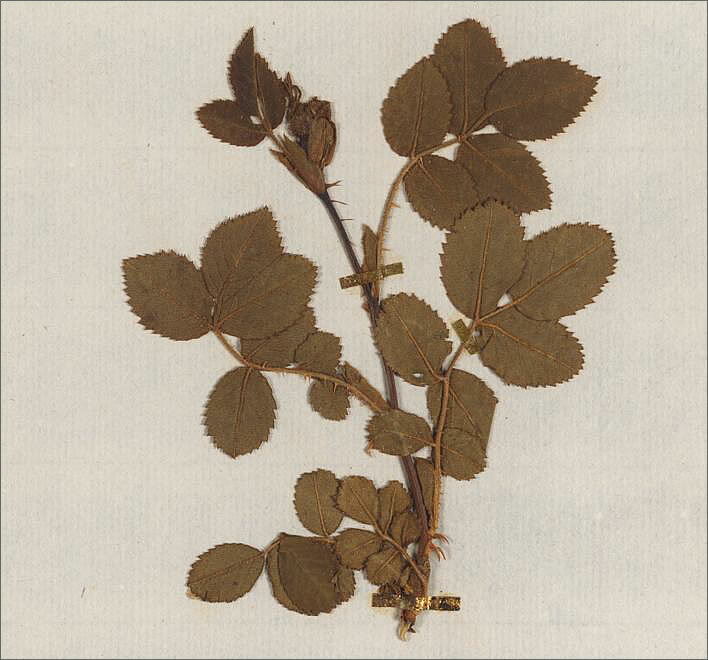 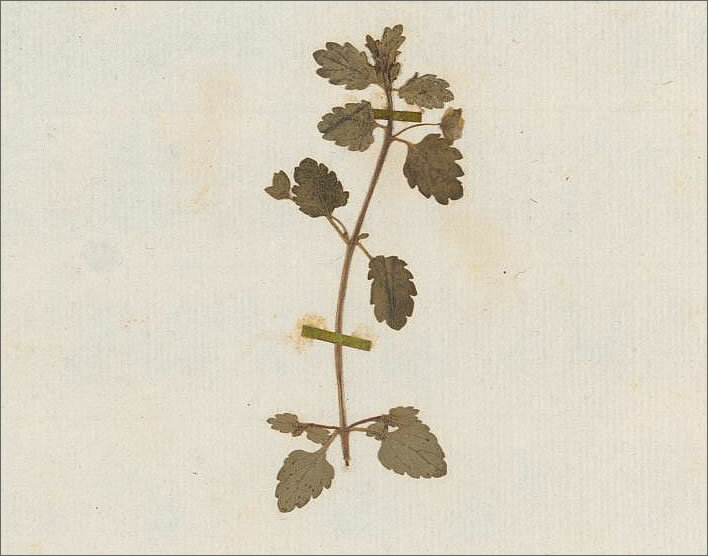 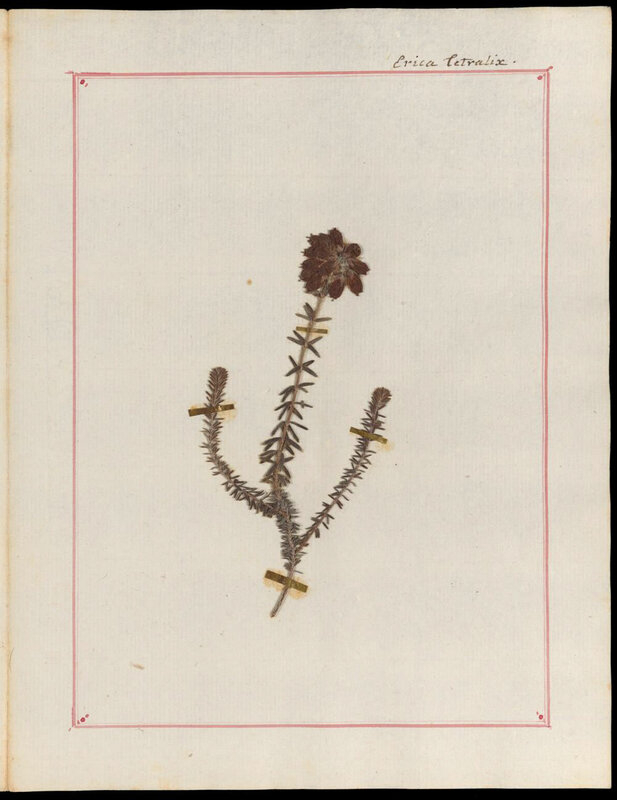 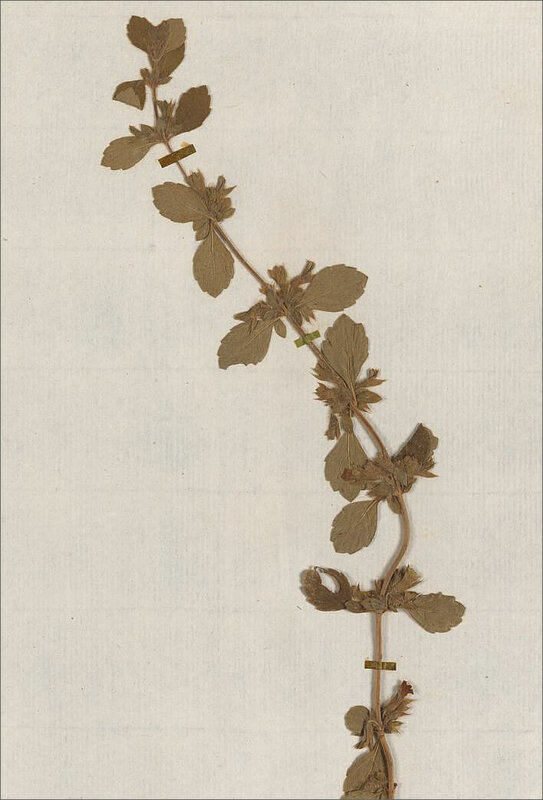 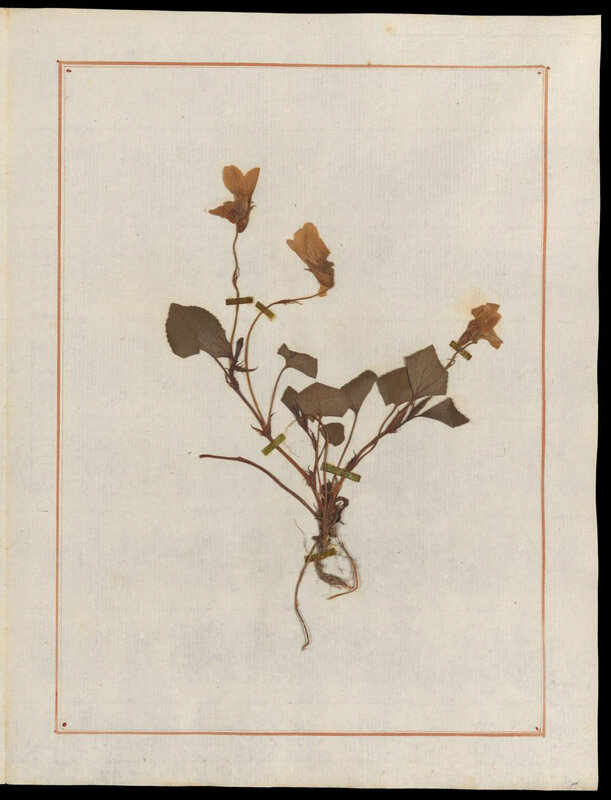 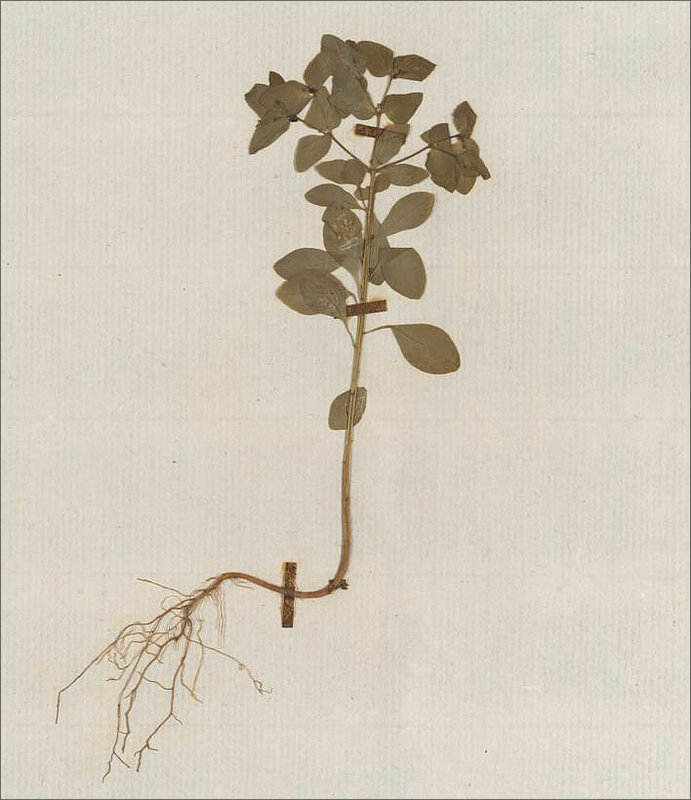 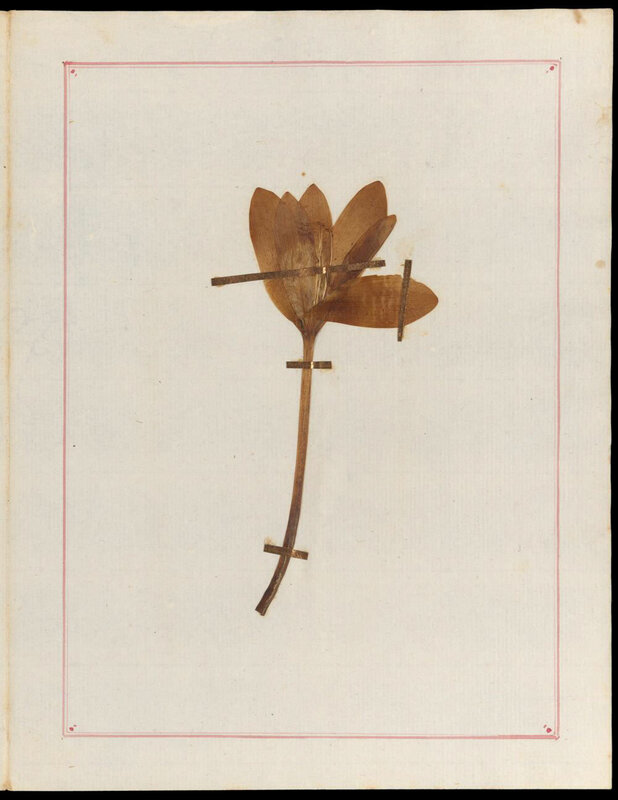 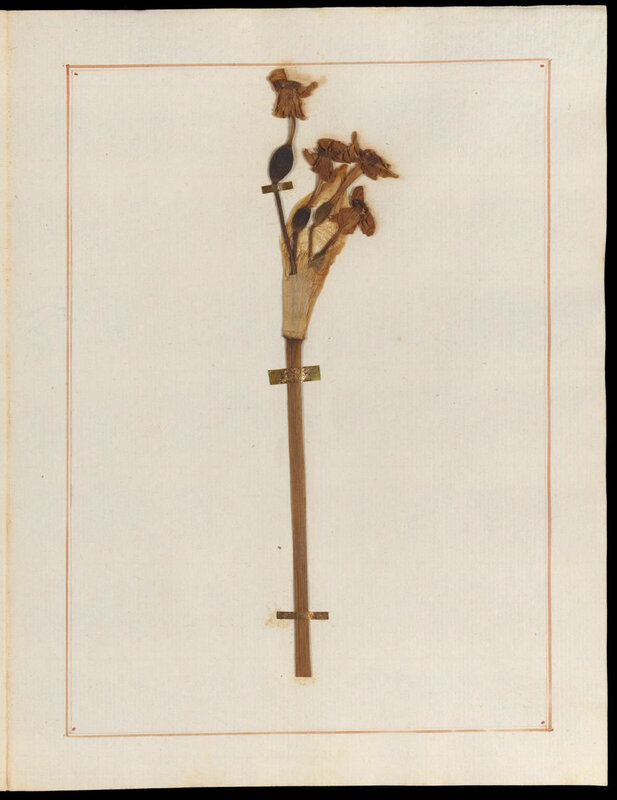 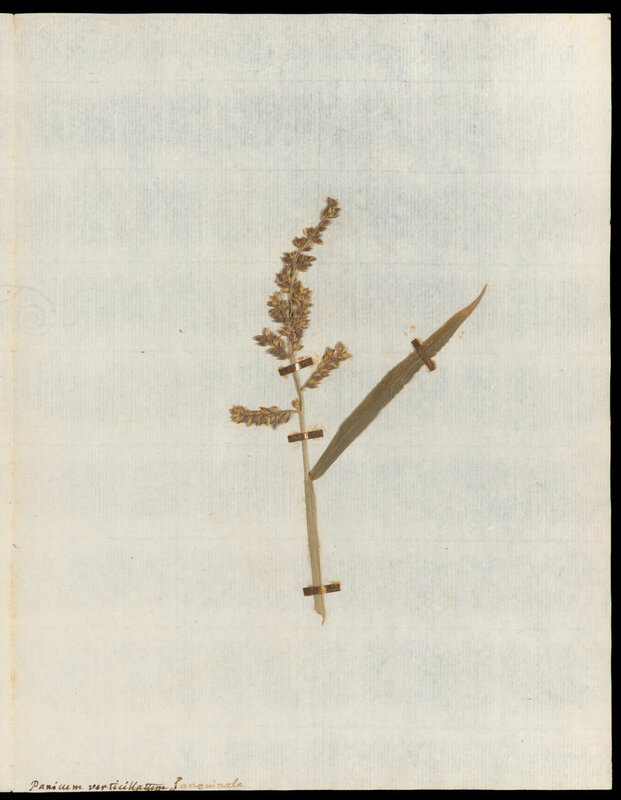 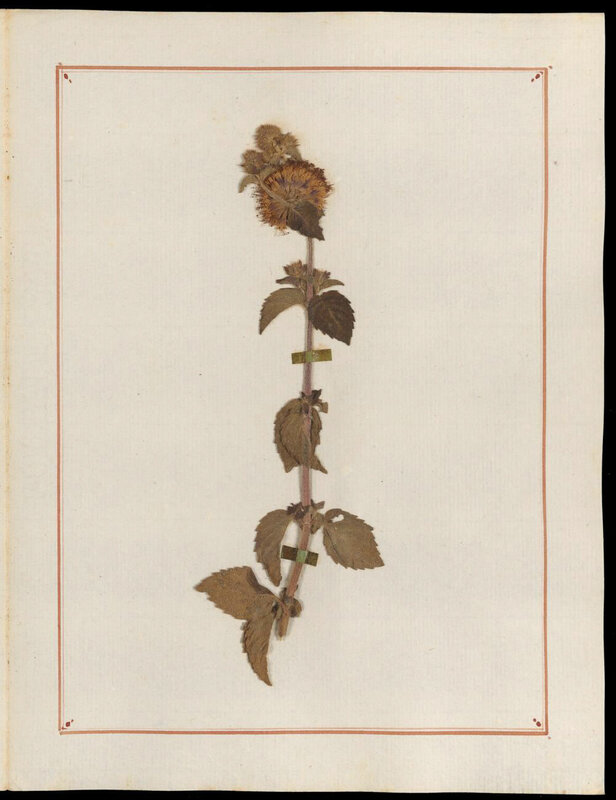 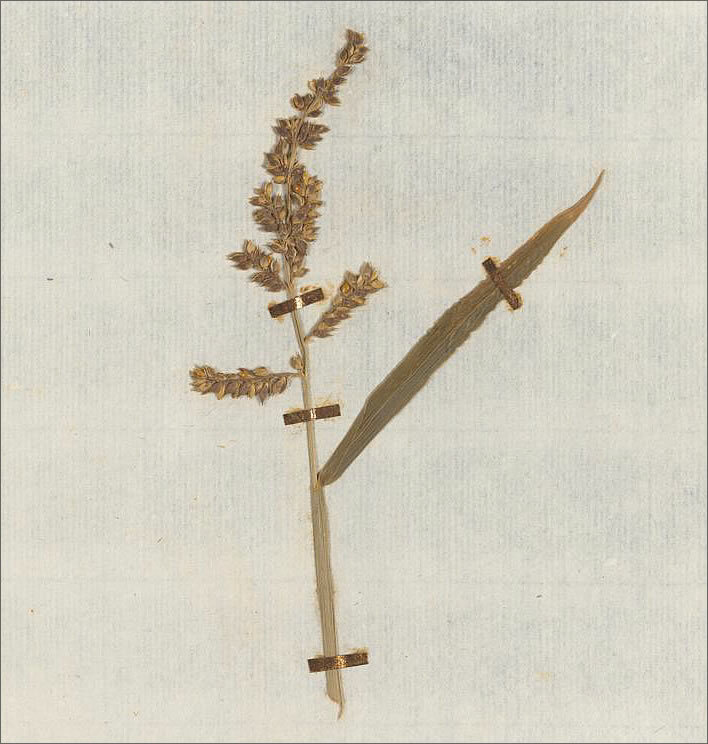 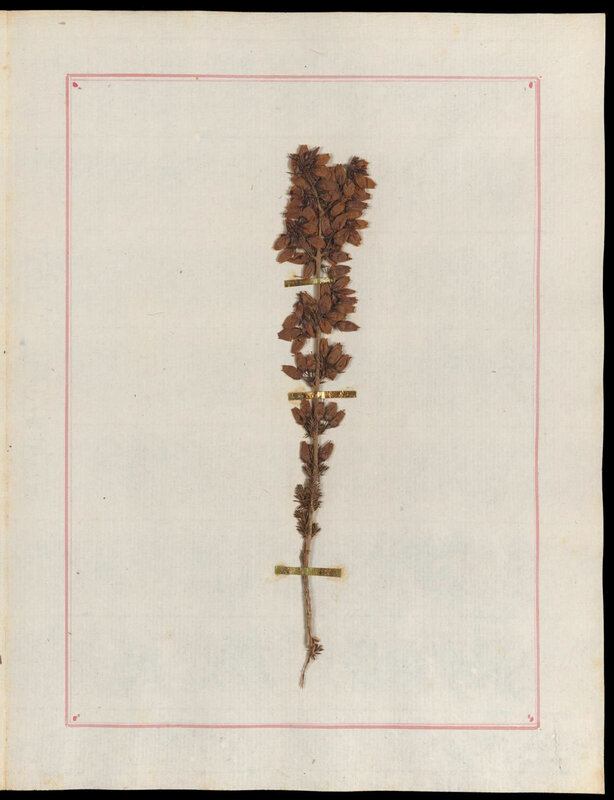 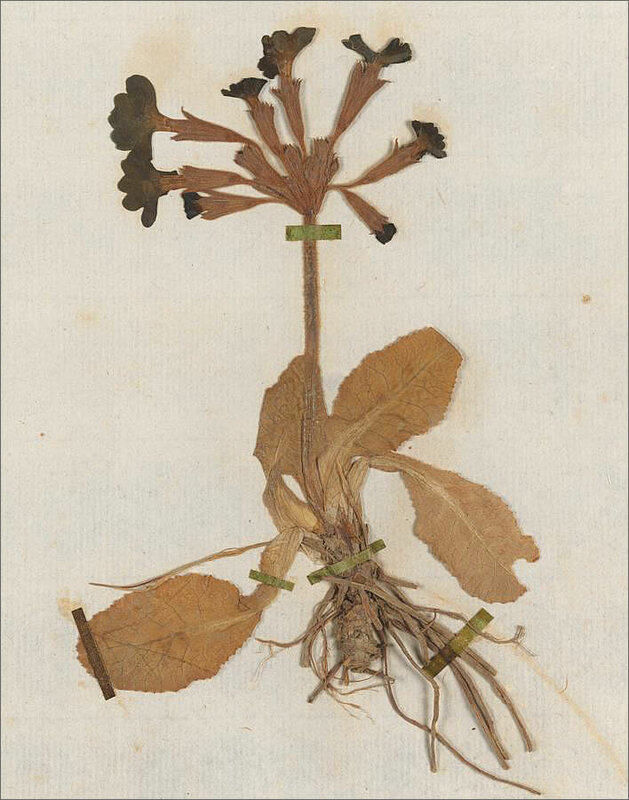 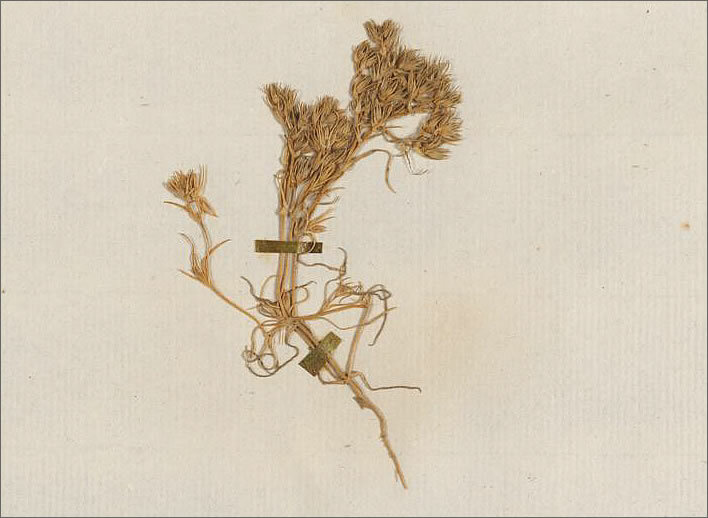 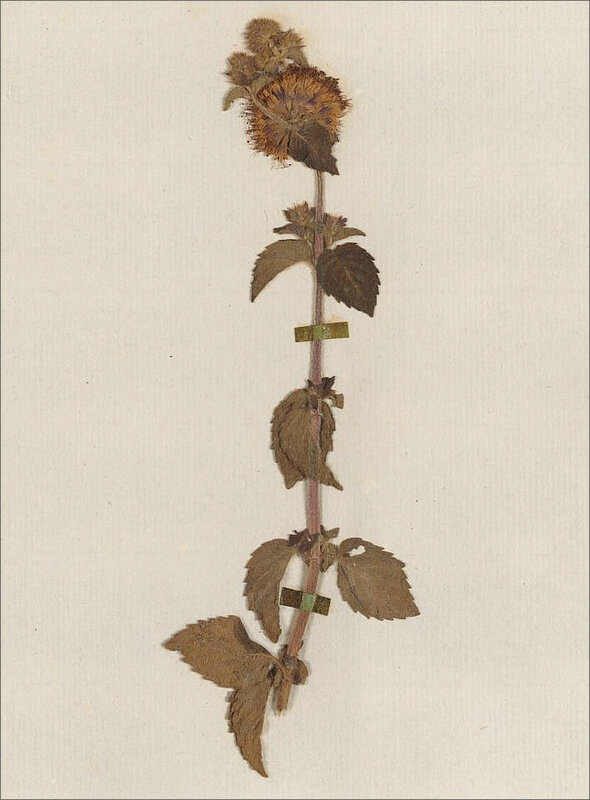 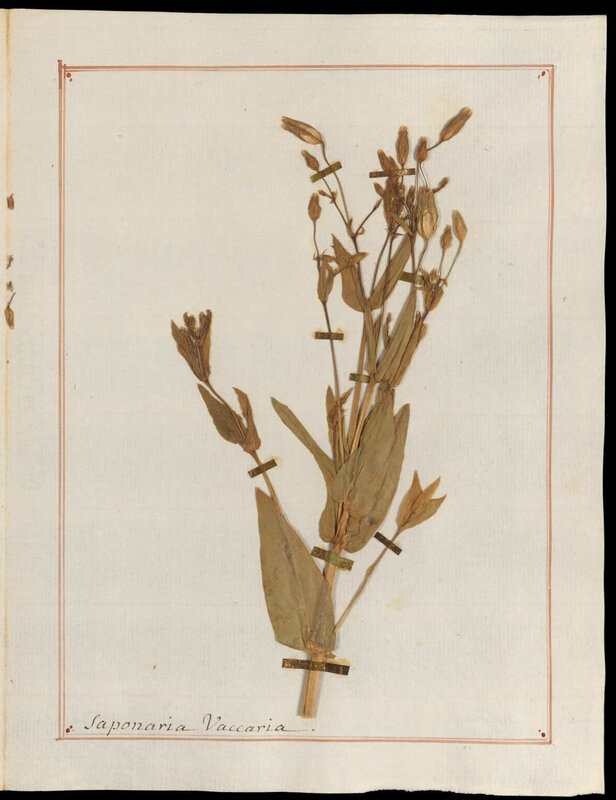 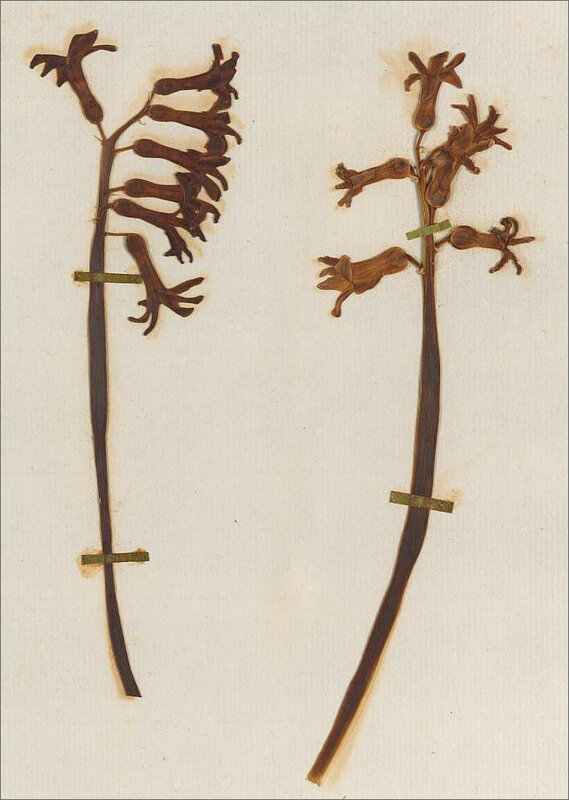 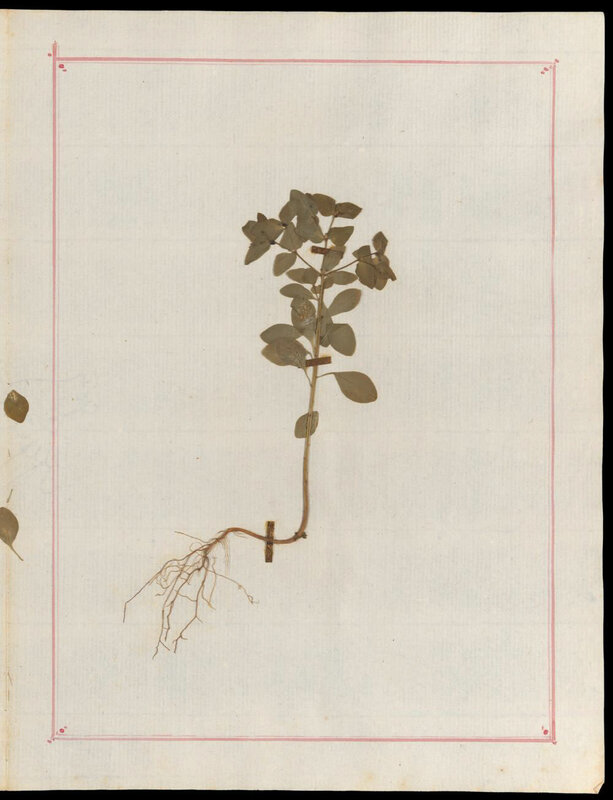 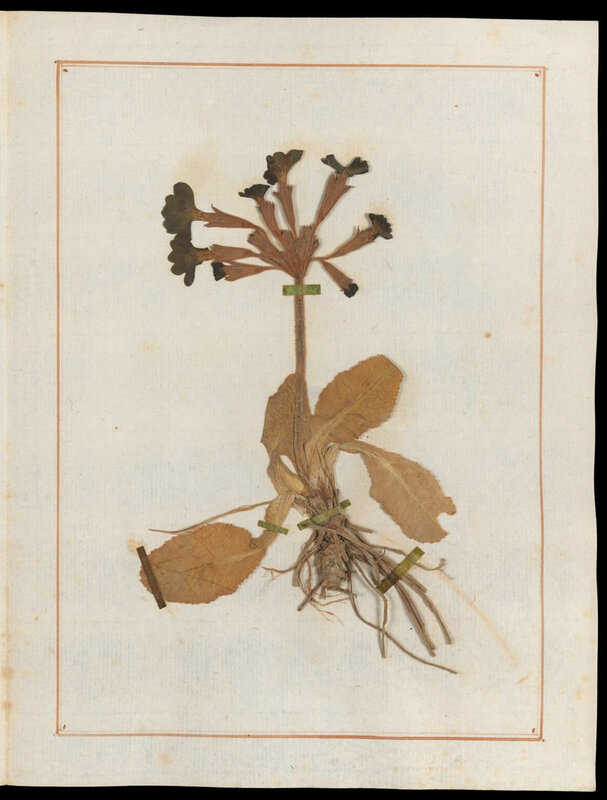 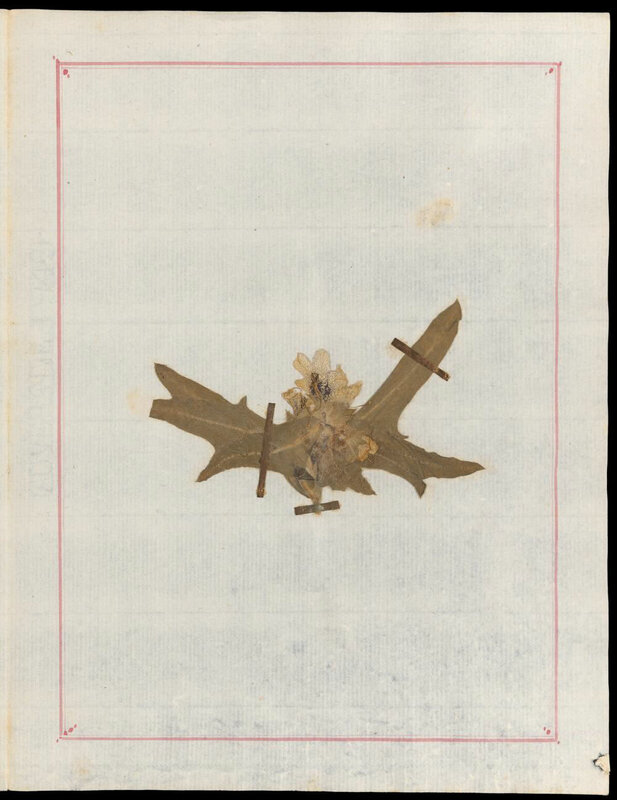 In order to display detail within our format limits we have cropped the image to the plant specimen. 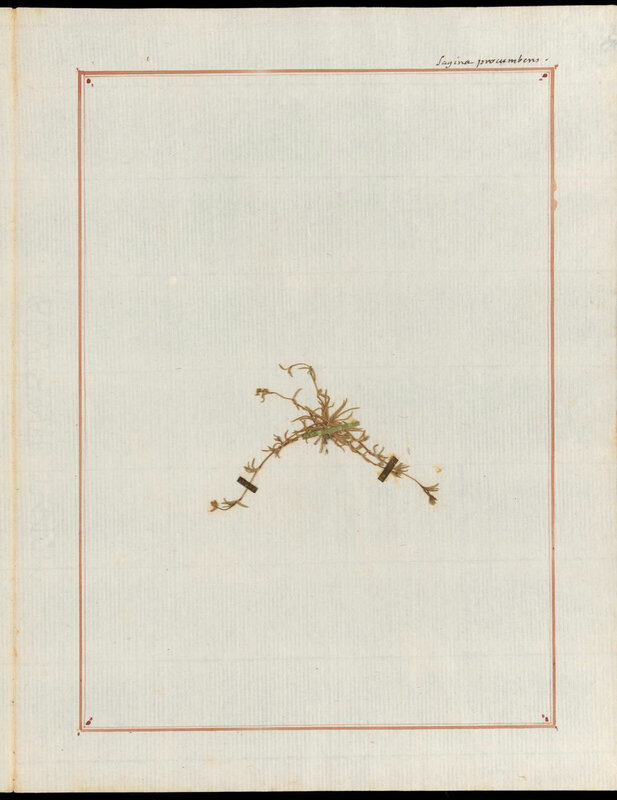 A click on any of these images will open a full page view in a new browser tab. 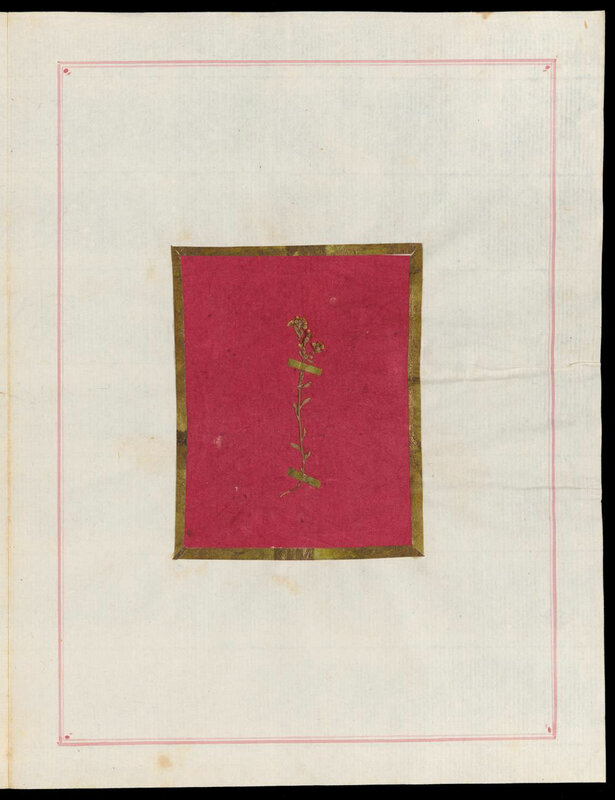 NB: The resolution of the larger image is not better than that on the web page. 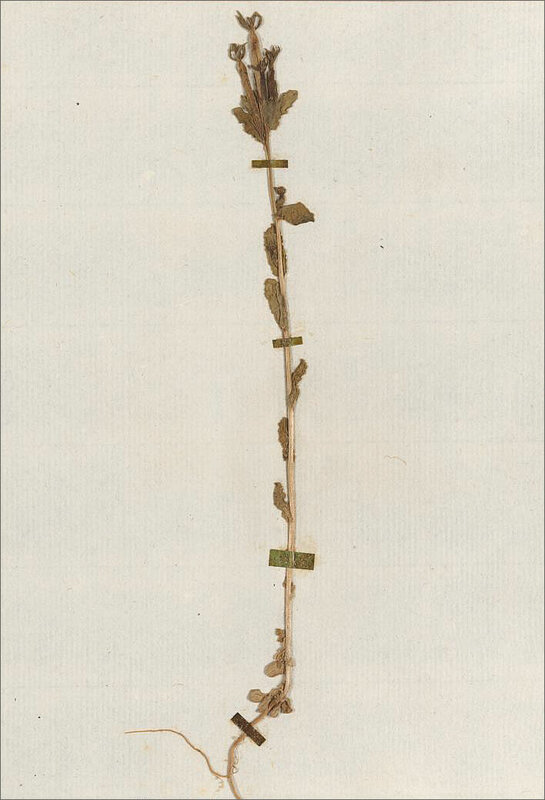 The first of the two luxuriously mounted specimens in the collection. 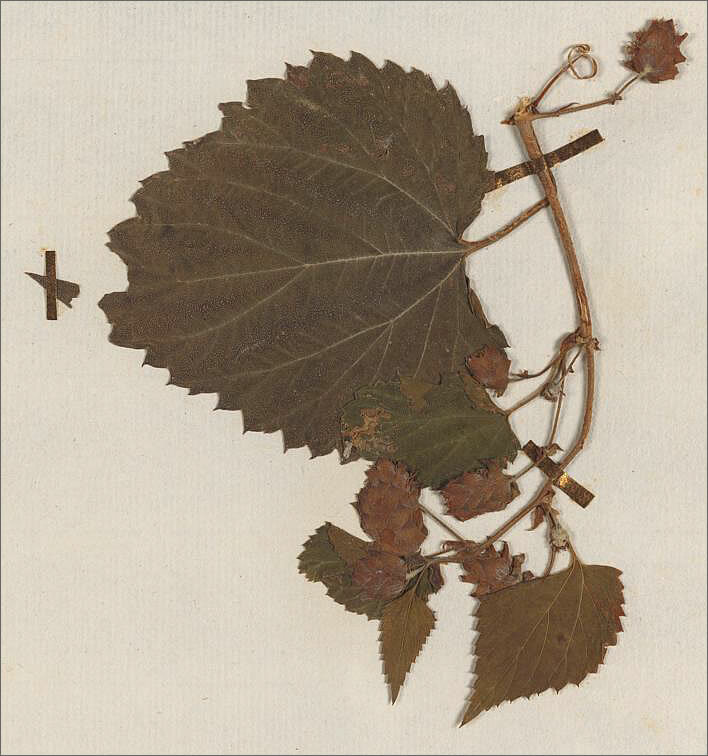 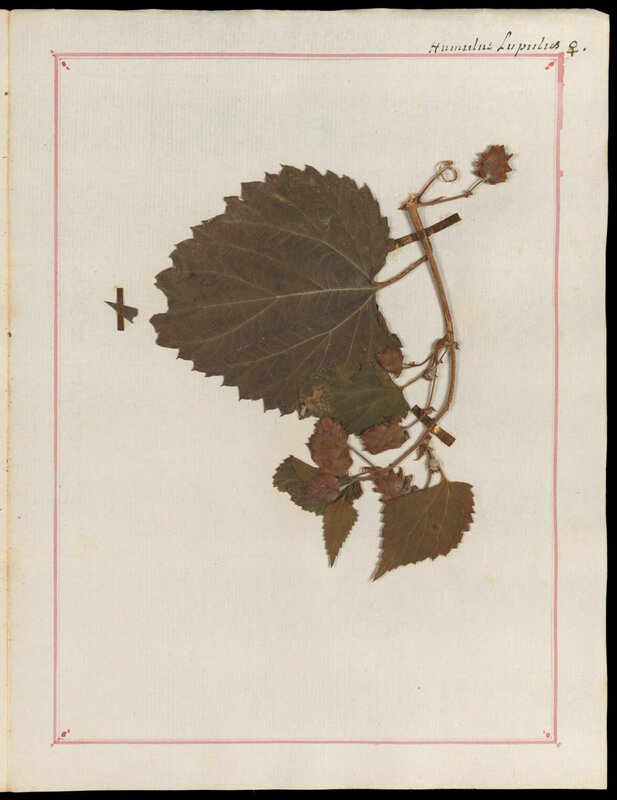 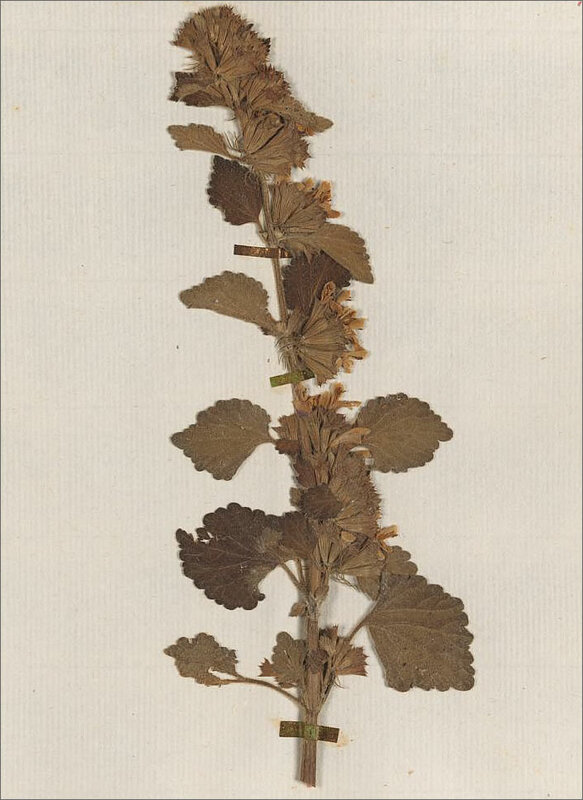 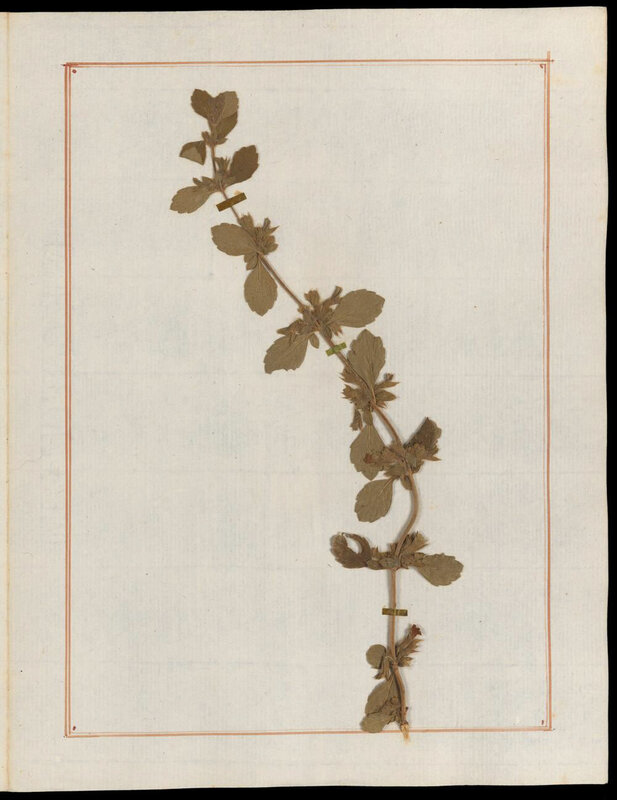 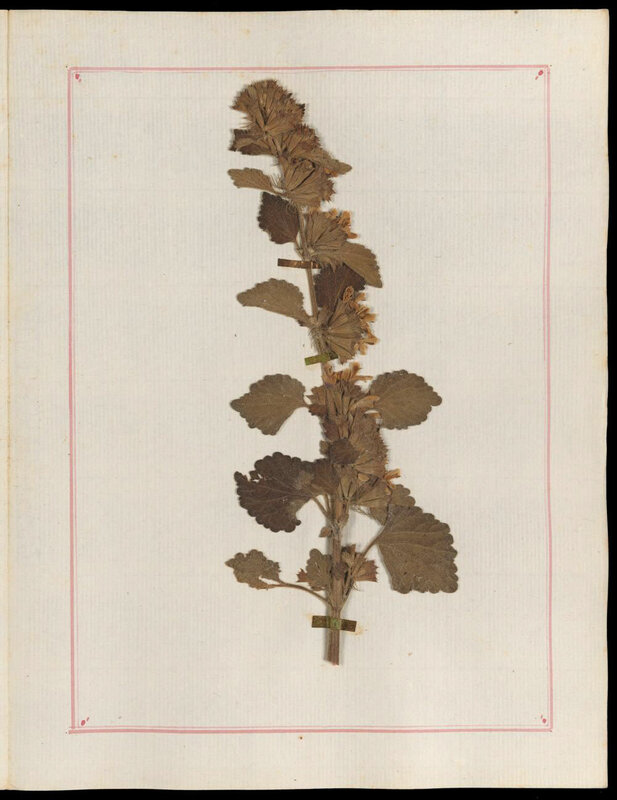 This image is of plate 28 of the herbarium. 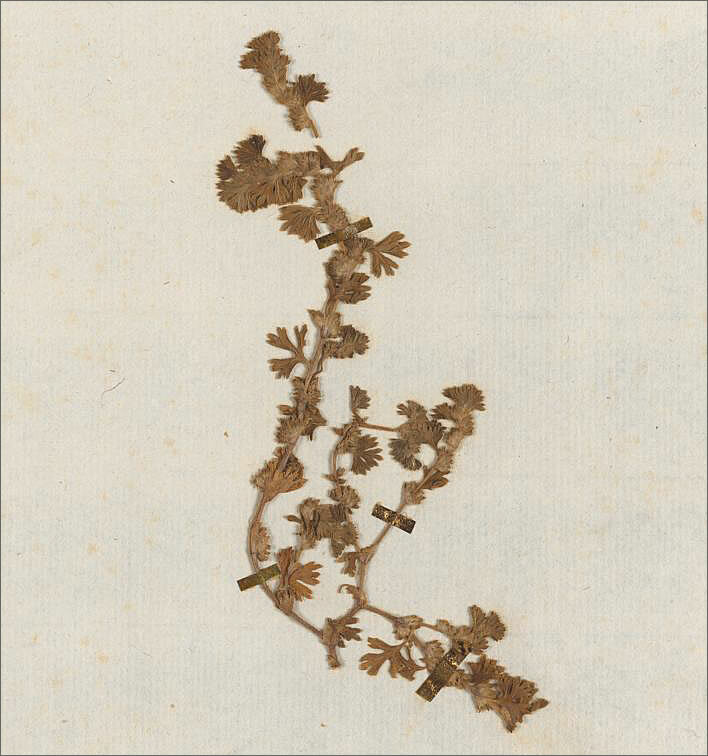 Rousseau names the plant as the Courroyette, more fully Courroyette des sables, in English given the less than beautiful name of the 'strapwort', Corrigiola litoralis, first classified in Linnaeus great collection of 1753. 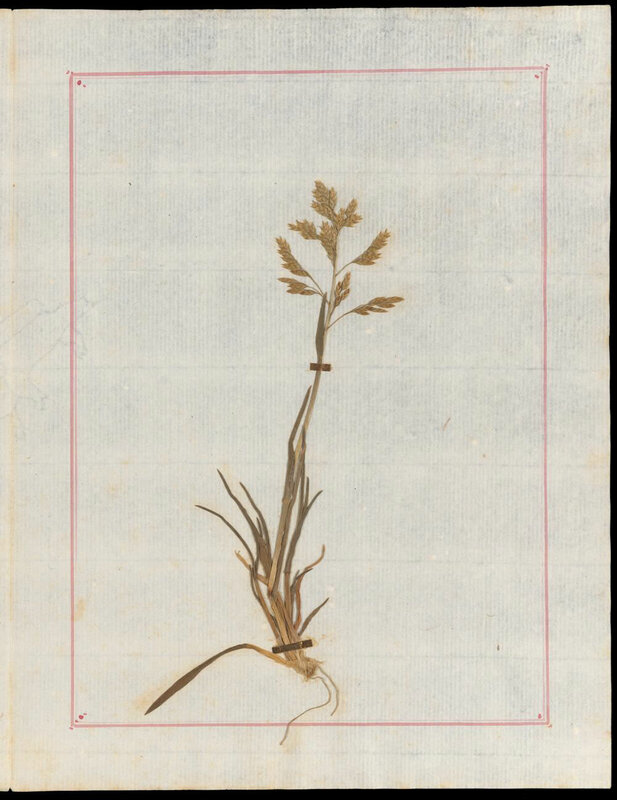 Rousseau comments: Cettes petites plantes aime le sable et les rivage; je l'ai cependant trouvée aussi tous au haut du Mont Pilat, 'These little plants like sand and shores; I found this one however at the top of Mont Pilat.' 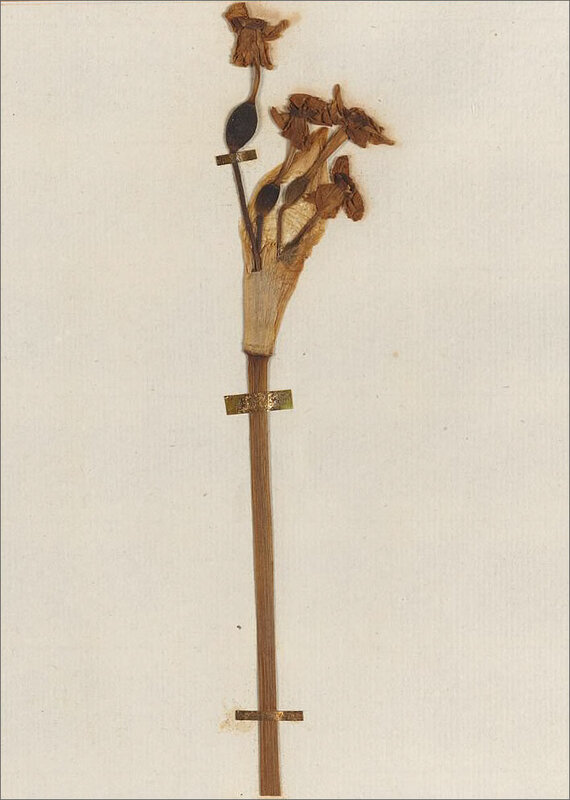 Mont Pilat is on the eastern edge of the Massif Central (not too far from Geneva). 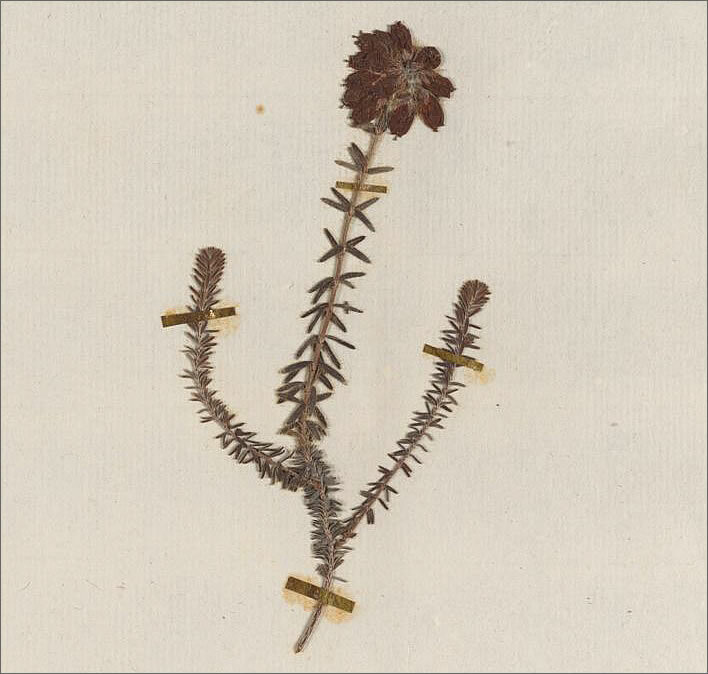 The second of the two luxuriously mounted specimens in the collection. 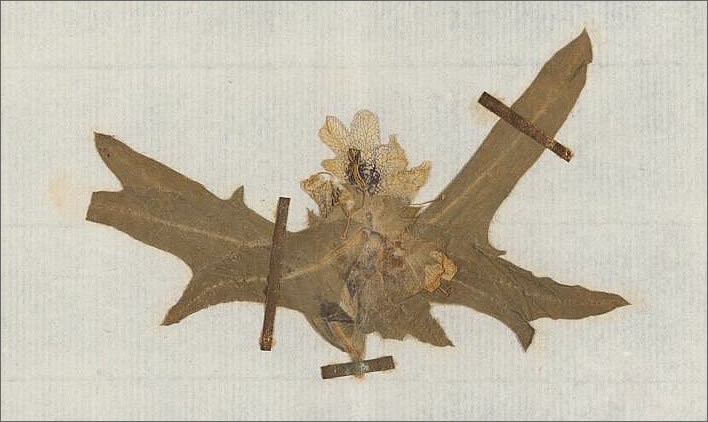 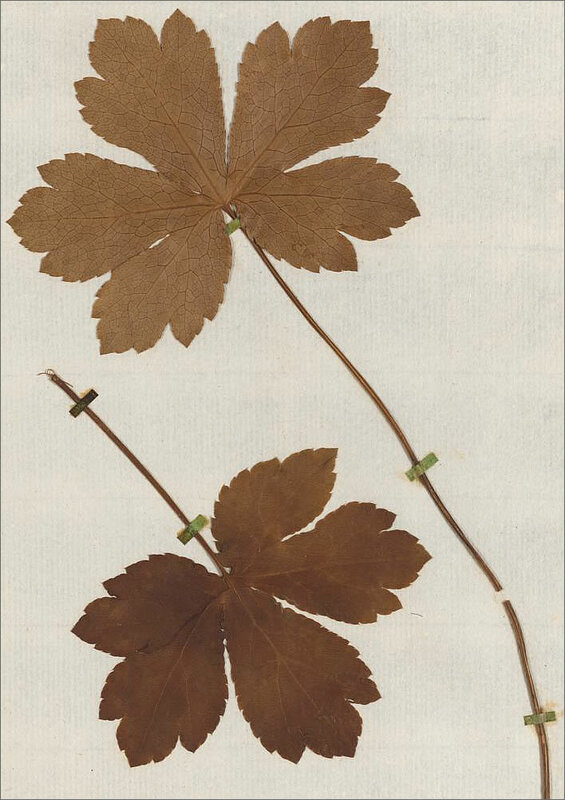 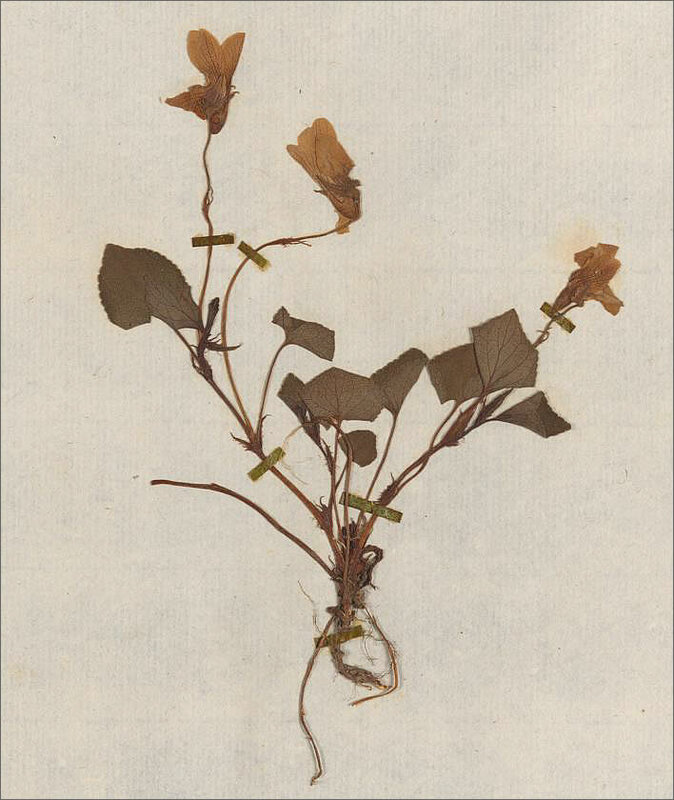 This image is of plate 60 of the herbarium. 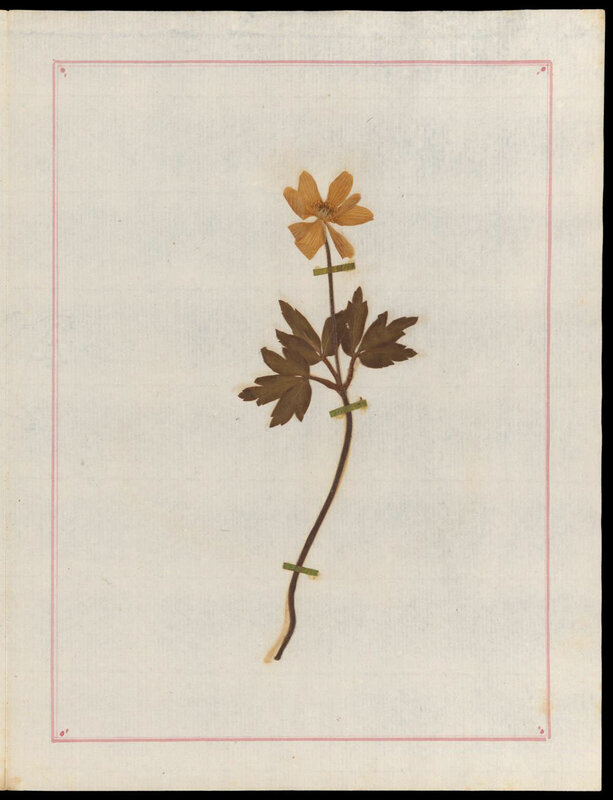 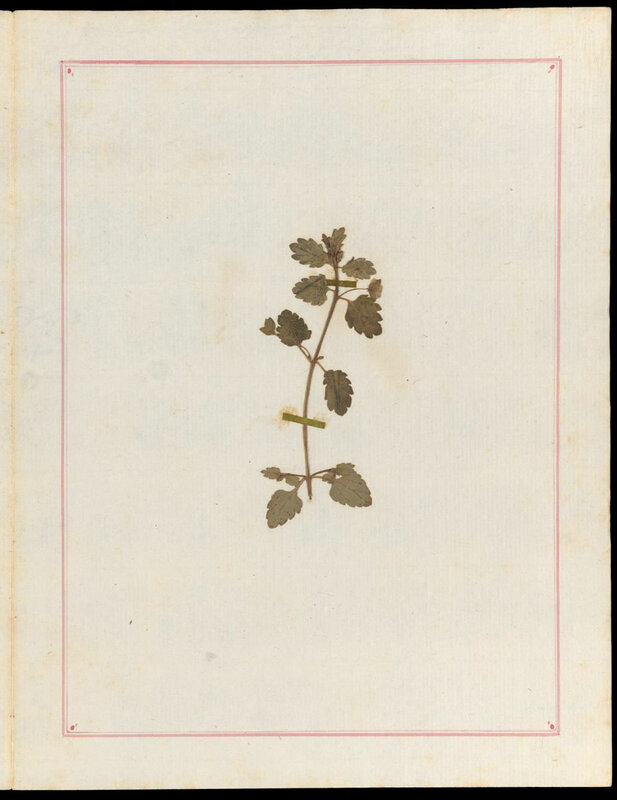 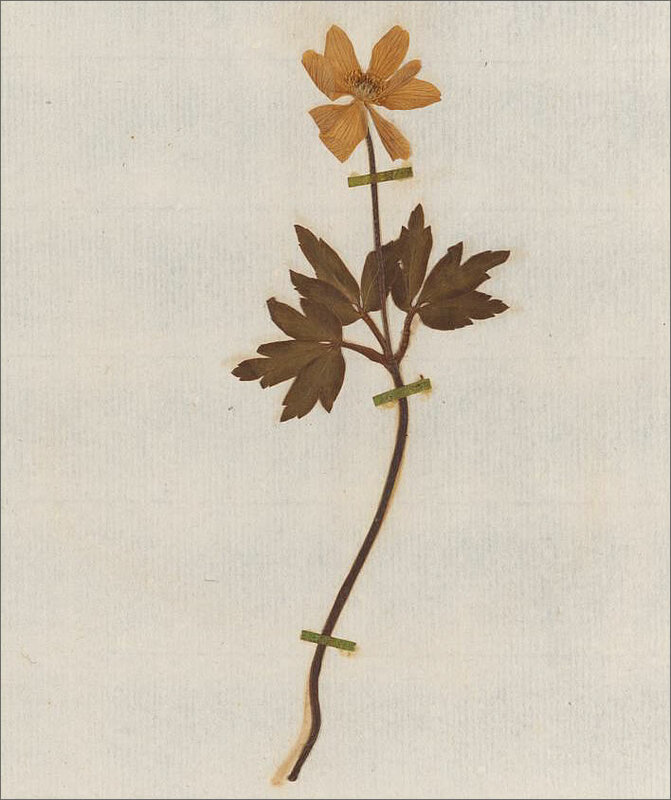 Rousseau names the plant as La renoncule d'eau, more fully la renoncule aquatique, the 'common water-crowfoot' in English, Ranunculus aquatilis, another from Linnaeus 1753. 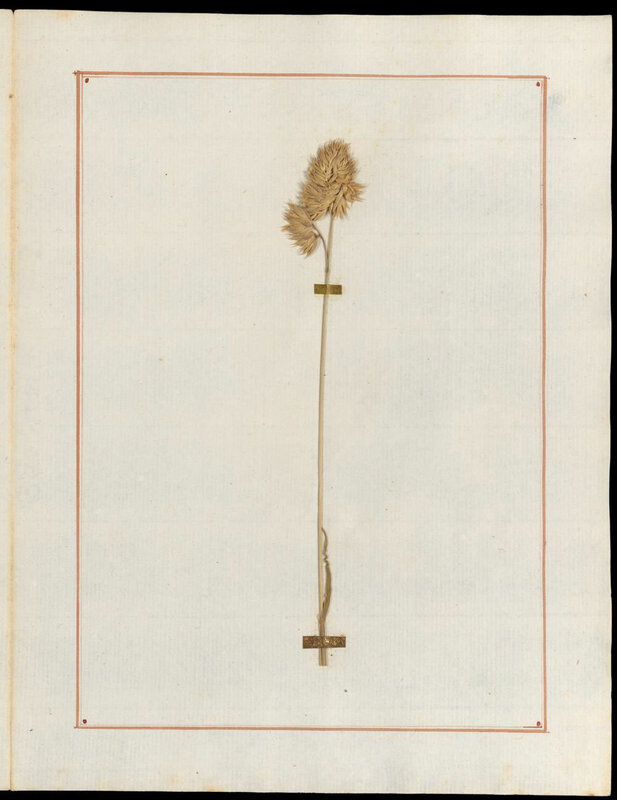 Rousseau makes no further comment about this plant in his key.